BBC Weather Centre Forecast - Arlington Sq. Preparations for the Arlington Square Summer Fete on Saturday 8th of September are progressing well. The fete is when we raise money for a local good cause, to fund our work to green our neighbourhood and the small amount of money we need to keep the Arlington Association functioning. We still need volunteers to help on the day so please do email if you can spare an hour. It is great way to get to know neighbours. Should you be going on holiday and not be around on the 8th please email and we can collect donations. Alternatively donations for all stalls can be brought to the Vicarage at 1A Arlington Square on Friday 7th September between 4.30pm and 7.30pm or on the day of the fete to the square from 10.30am. Our raffle already has some great prizes lined-up so again if you are not going to be around on the day and would like some tickets please do email and we will ensure you are reserved some, they are a £1 each. Children’s Fancy Dress competition has a Come as your Favourite Book Character Theme as it is th UN's International Literacy Day on 8th September. Many thanks to Alison and Jeffery for another great edition. Suggestions for articles are most welcome so please email any to us. Thanks to the generosity of Arlingtonians and friends at our Christmas Fair in the Square we raised £1000 to support our two nominated good causes, we also raised £250 to support our work to green our neighbourhood. Pack-up and the Mildmay Mission Hospital will both receive donations of £500 to help support their work. Once again many thanks to everyone who helped make our annual Christmas Fair such a success despite some challenging weather conditions. When does the Christmas season begin? Switching on the Oxford Street lights? Too early. Festival of nine lessons and carols from King’s College, Cambridge? Too late. 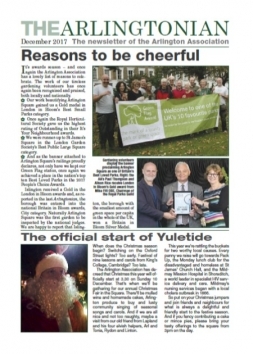 The Arlington Association has decreed that Christmas this year will officially start at 3.30 on Sunday 10 December. That’s when we’ll be gathering for our annual Christmas Fair in the Square. There’ll be mulled wine and homemade cakes, Arlington produce to buy and lusty community singing of seasonal songs and carols. And if we are all nice and not too naughty, maybe a visit from our old friend from Lapland and his four elvish helpers, Arl and Tonia, Rydon and Linton. This year we’re rattling the buckets for two worthy local causes. Every penny we raise will go towards Pack Up, the Monday lunch club for the disadvantaged and homeless at St James’ Church Hall, and the Mildmay Mission Hospital in East London, a world leader in specialist HIV service delivery and care. Mildmay’s nursing services began with a local cholera outbreak in 1866. So put on your Christmas jumpers and join friends and neighbours for what is always a delightful and friendly start to the festive season. 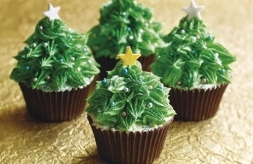 And if you fancy contributing a cake or mince pies, please bring your tasty offerings to the square from 3pm on the day. Today, environmental charity Keep Britain Tidy announced the People’s Choice ten favourite UK parks and Arlington Square is one of them. A record-breaking 73,349 votes was cast to decide the nation’s favourite parks from a list of 1,799 Green Flag parks. Green Flags are awarded to the best-managed parks and green spaces in the UK. To find the best of the best, Keep Britain Tidy asked the public to vote for their favourite parks, which they did in record numbers. The ten winners are spread across England, Scotland and Wales, including large and small sites, traditional parks and wild unusual spaces. Some of the winners are run by councils, others are managed by community groups and one is a university campus. Arlington Square is the only park in London to make the list of the nation’s top ten favourite parks. Four of the winners (Cassiobury Park, Saltwell Park, the Wilderness Lake and Whiteknights campus) have been awarded this accolade for the first time this year, while the remaining six including Arlington Square have maintained their top spot in people’s hearts. 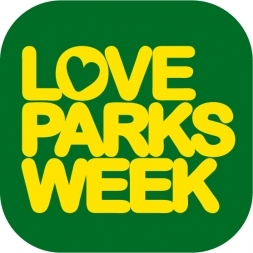 International Green Flag Award Manager Paul Todd said: “Following the success of this summer’s #LoveParks Week, the record number of votes for the People’s Choice Awards – more than double the number received last year – shows how much their favourite green spaces mean to people. “Massive congratulations to our ten hugely deserving winners, and all the staff, volunteers and supporters who work so hard to maintain these well-loved green spaces to such a high standard. Thank you to everyone who took the time to vote for Arlington Square. We will celebrate this success along with the many other awards we have won this year at our Community Gardening Day this Saturday from 10.00am. 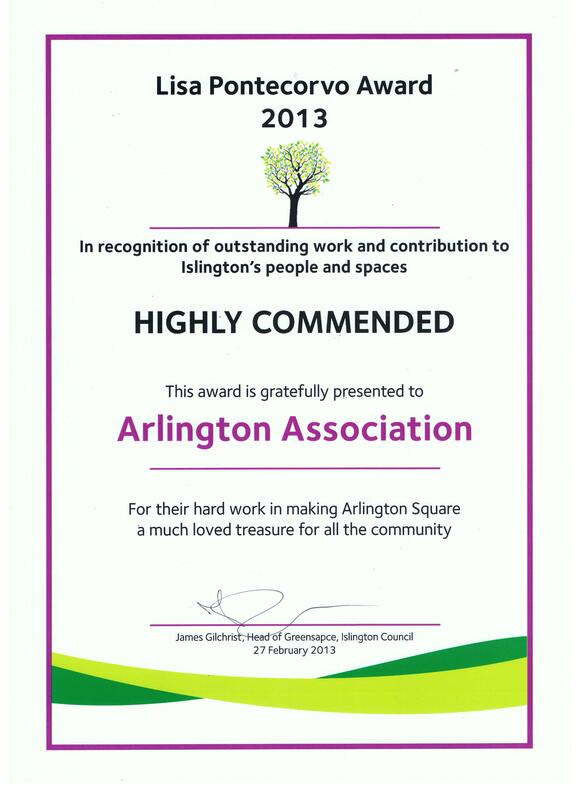 Today the Arlington Association’s work to improve Arlington Square was recognised at the London in Bloom Awards. We received a Gold Medal in the Best Small Parks category and were awarded an Outstanding rating in the RHS It’s Your Neighbourhood scheme. 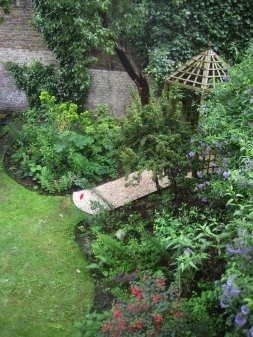 Many thanks to all our gardening volunteers who have helped make Arlington Square such a wonderful community resource. Preparations for the Arlington Square Summer Fete on Saturday 2nd of September are progressing well. 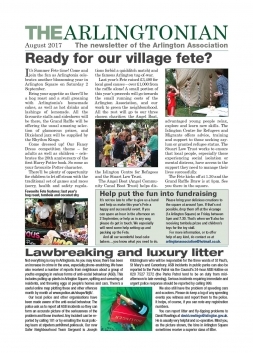 The fete is when we raise money for local good causes, to fund our work to green our neighbourhood and the small amount of money we need to keep the Arlington Association functioning. Should you be going on holiday and not be around on the 2nd please email and we can collect donations. Alternatively donations for all stalls can be brought to the Vicarage at 1A Arlington Square on Friday 1st September between 5.00pm and 7.30pm or on the day of the fete to the square from 10.30am. 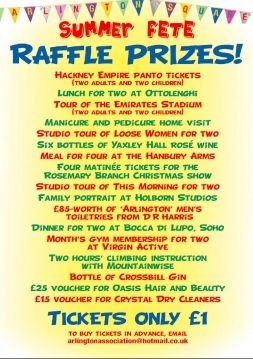 Our raffle already has some great prizes lined-up so again if you are not going to be around on the day and would like some tickets please do email and we will ensure you are reserved some, they are a £1 each. Children’s Fancy Dress competition has a Harry Potter theme. 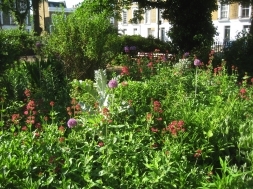 On Saturday we have a full day of community gardening in Arlington Square (10.00am to 5.00pm) as we will be welcoming visitors as part of Open Garden Squares Weekend. Everyone very welcome to come and help or just have a look around the square and talk to our volunteer gardeners about the community transformation of this public square that was voted in 2016 on of the nations top ten parks. We have traditionally sold tea and cake to OGSW visitors to raise funds for our work to green the neighbourhood, in light of the tragedy of the devastating fire at Grenfell Tower we plan to donate 50 percent of all we raise from tea, cake, lemonade and postcard sales to the fund that has been set-up to help the victims. Any cake donations welcome from 10.00am in the square. Many thanks to everyone who helped make Sunday’s garden openings such as success. Thankfully this year we had good weather and we welcomed 250 visitors and raised over £1500 for charity and £500 to support our work to green the neighbourhood. For £7 (children free) you have access to all 9 gardens from 1.00pm to 5.30pm, all proceeds go to charity. These include Hospice UK, Marie Curie Cancer Care, Parkinson’s UK, etc. Last year we raised over £1300 and overall the NGS raised over £2.5m. Tickets can be bought at any garden (except 27 Arlington Square). Tea and homemade cakes will be served at the Vicarage and all proceeds from these will go towards supporting the Arlington Association’s gardening activities. All this will be accompanied by live music performed by Fuzion, a cello and piano duo who will be performing in the vicarage garden from around 2.30pm. Our next Community Gardening Day is on Saturday from 10.00am. We will be planting, weeding and giving the Arlington Square a Spring clean, so jobs for all abilities and gardening experience. We can provide tools and gardening gloves, etc. Please consider coming along no matter for how long. These events are a good way of helping to improve our neighbourhood, benefiting the environment and getting to know neighbours. Our replanting of the circular beds has been completed. Many thanks to everyone who has helped make this possible by volunteering their time in recent weeks. Yesterday we had a marathon community gardening day that started before 8.00am and completed just after 5.00pm. Volunteers ranged from the under 7’s to the over 70’s and between us we planted well over a 1000 plants of 14 different varieties. With warm weather forecast ahead we hope to see the plants growing and thriving in the months to come. In the Autumn we will plant the beds with Spring flowering bulbs. 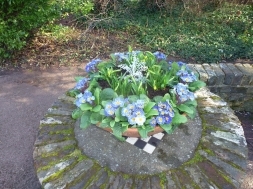 The circular bed makeover was made possible by a grant from the Tesco Bags of Help scheme. Our next Community Gardening Day is on Saturday from 10.00am. We will be preparing for the replanting of the circular beds, good progress has already been made in moving plants and shrubs to other parts of the square and on Saturday the focus will be on removing roots, bulbs and weeds so the beds are ready for new compost to be spread and for them being replanted later in the month. We can provide tools and gardening gloves, etc. Please consider coming along no matter for how long, no gardening experience needed. These events are a good way of helping to improve our neighbourhood, benefiting the environment and getting to know neighbours. We plan to have an extra Community Gardening Day on Saturday 18th February when we will be planting up the circular beds. Everyone very welcome no matter for how long. As always tea, coffee and neighbourly chat. Everyone very welcome no matter your level of gardening expertise. Many thanks to everybody who has generously offered support and volunteered over the last 12 months, we have a busy few months planned ahead and work continues this Saturday from 10.00am at our next Community Gardening Day. 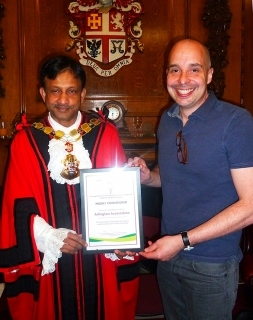 Arlington Square once again was recognised at the Islington in Bloom awards ceremony held at Islington Town Hall. Gordon McArthur, Arlington Association Chair and committee member Alison Rice attended the ceremony and were delighted to accept the prize for Arlington Square coming first in the Best Residential Communal Garden category. Clearly all the hard work by our gardening volunteers has paid off. Great news is we have been shortlisted for a grant from the Tesco Bags of Help scheme. Bags of Help offers community groups and projects in each of Tesco’s 416 regions across the UK a share of revenue generated from the 5p charge levied on single-use carrier bags. The public will now vote in store from 31 October to 13 November on who should receive the £12,000, £10,000 and £8,000 awards. In total, there is over £12.5 million up for grabs. Please remember to vote for Arlington Square when you visit your local Tesco store between 31 October to 13 November. Despite rather gloomy weather and heavy rain at the end of the day, our 7th annual Summer Fete was a great success. Everyone seemed to have a marvellous time and thanks to our army of volunteers we were able not only to have fun as neighbours, but also raise funds for some very deserving local good causes. Many many thanks to everyone who contributed, from donating tombola prizes, baking cakes, making preserves, carrying tables to organising the children's races, without such generosity this community event would not be possible. We managed to raise £3400 which will support three local good causes, help fund our work to green the neighbourhood and cover the small running costs of the Arlington Association. Now our thoughts, with time for a brief rest, turn to our annual Christmas Fair in Square on Sunday 11th December, please mark in your diaries. 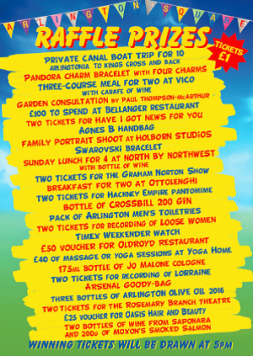 Thanks to the generosity of neighbours and local businesses we have a record breaking 26 amazing raffle prizes. Tickets are only £1 and can be bought at the raffle stall at the fete on Saturday. If your number is called and you are present you can select any available prize, if you are not present the highest available prize on the list below will be awarded to you and you will be contacted in the days following the fete. A full list of prizes can be downloaded in the here. Preparations for the Arlington Square Summer Fete on Saturday 3rd of September are progressing well. 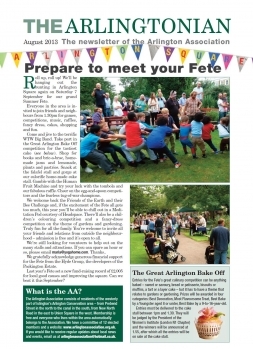 The fete is when we raise money for local good causes, to fund our work to green our neighbourhood and the small amount of money we need to keep the Arlington Association functioning. Should you be going on holiday and not be around on the 3rd please email and we can collect donations. Alternatively donations for all stalls can be brought to the Vicarage at 1A Arlington Square on Friday 2nd September between 4.30pm and 7.30pm or on the day of the fete to the square from 10.30am. 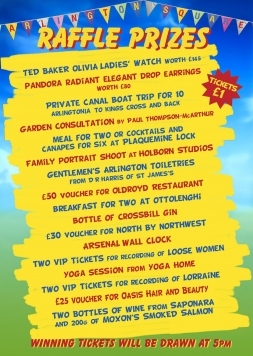 Our raffle already has some great prizes lined-up so again if you are not going to be around on the day and would like some tickets please do email and we will ensure you are reserved some, they are a £1 each. 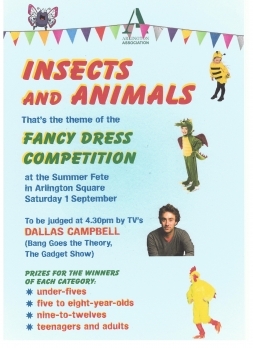 Children’s Fancy Dress competition has a Mr Men and Little Miss theme, more details to follow. guided tours of the planting. • FROM 1pm local musician Alice Flaye will be playing her harp. 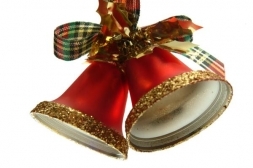 • AROUND 3pm there’ll be a performance by the St Vedast Handbell Ringers, with a programme that includes the premiere of a new arrangement by composer Gregory Rose for handbells and harp. • REFRESHMENTS will be available throughout the day. • FREE horticultural tours and advice from our gardening experts. • FREE Tai Chi session at 2.30, led by Jane Ward. All are welcome to try the ancient Chinese art. • FLOW YOGA at 3.30: a free session led by yoga instructor Mary Schnorrenberg. Open to anyone – yoga experts and complete beginners. • REFRESHMENTS will be available throughout the afternoon. Many thanks to everyone who helped make Sunday’s garden openings such as success. 9 very different gardens opened as part of the National Gardens Scheme. Despite the weather we welcomed over 200 visitors and raised just over £1300 for charity and £350 to support our work to green the neighbourhood. Entry fees go to support a variety of NGS charities including Marie Curie Cancer Care, Hospice UK and MacMillan Cancer Support. Many thanks to everyone who helped make our Big Lunch 2016 such a huge success. With wonderful sunny weather, live music, children's games, picnic food and the occasional glass of wine all combined to make for the perfect community event. 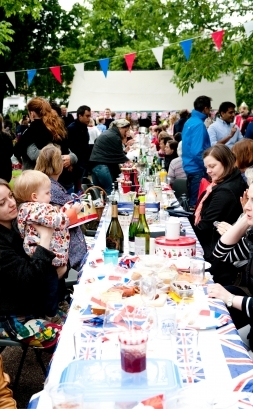 On the afternoon of Sunday 5th June we will be holding a Big Lunch in Arlington Square. 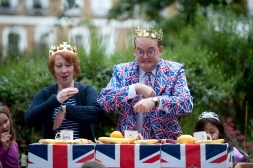 The Big Lunch is a national event with the aim of getting as many people as possible across the whole of the UK to have lunch with their neighbours annually in June in a simple act of community, friendship and fun. We will be celebrating a great year of community volunteering plus the Queen’s 90th birthday. Everyone is welcome so please feel free to invite friends and relatives. We will have live music and children’s games and fancy dress. There will be no stalls, we will have a long table down the middle of the square where neighbours can sit and enjoy their picnic lunch, you are also welcome to bring rugs and picnic on the grass areas. We expect the square to be busy (especially if the weather is kind) so would ask there are no BBQ’s. More details to follow, it will run from 1.00pm to around 4.30pm. We will need some volunteers to help move table and chairs in the morning from the church hall and back again at the end of the day, plus Gail would ask for help running the children’s activities. So if you can spare some time please get in touch. We will also be having a collection for St Joseph’s Hospice and Alison has asked for some help to shake a bucket for 30 minutes, again get in touch if you would like to help raise some funds for our local hospice. Join us for our Annual General Meeting on Monday 25th April at 7pm upstairs at the Hanbury Arms on Arlington Square. We will be reviewing the year, selecting the good causes we will support in the coming year and hearing from our local Councillor Martin Klute and from the local Police about issues impacting our neighbourhood. So far we have had 3 Community Gardening Days in 2016 and the difference our volunteers are making to Arlington Square is very evident. The square is looking magnificent and the areas that were improved over recent months are beginning to bloom. Our next Community Gardening Day in on Saturday, 2nd April from 10am, everyone very welcome. 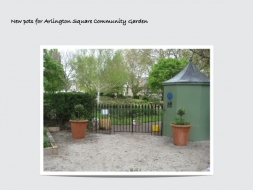 Join us for the next Community Gardening Day in Arlington Square on Saturday 19th March from 10.00am. We will be planting, weeding and giving the square some TLC. Come along even for a short period, all the family welcome and don’t worry if you are not a gardener, we will show you what to do, plus tea and coffee is provided. Gardening gloves and a trowel would be good to bring if you have them but if not we can supply. Not only is it a great way to get some exercise, you also get the opportunity meet your neighbours and catch-up on local news. Our new planting in the north west corner is nearly complete, thanks to all the Arlington Association volunteers who have helped make this happen. Join us for the next Community Gardening Day in Arlington Square on Saturday 20th February from 10.00am. We will be planting, weeding and giving the square some TLC. Join us for the first Community Gardening Day of 2016 in Arlington Square on Saturday 30th January from 10.00am. We will be planting, weeding and giving the square some TLC. Our Christmas Fair in the Square was a great success, we were fortunate with the weather and everyone seemed to have a marvellous time. As with all these community events it takes a lot of organising and many people give up a great deal of time to make them a success. Particular thanks to Carol for her generous donation of preserves, Alison and Jeffery for organising the singing, Daniel for playing the piano, Heather and Julie for keeping us supplied with mulled wine, James for sorting out all the logistics and being Santa and last but not least Suzi and Lindsey for being our wonderful elves Arl and Tonia. Thanks to everyone else who helped on the day and donated cakes. 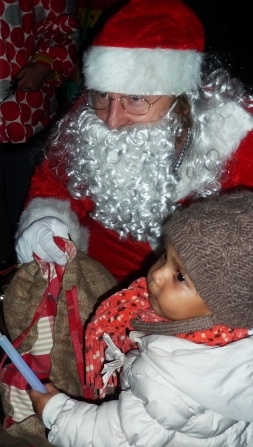 Thanks to the generosity of Arlingtonians we raised an amazing £500 each for our local hospice and a homeless charity. We also raised just over £200 towards our work to green our neighbourhood. Many thanks to everyone who has helped in so many ways during 2015, it has been a great year. We hope you all have a wonderful Christmas and New Year. It’s official. The festive season starts on Sunday 13 December at our annual Fair in the Square. 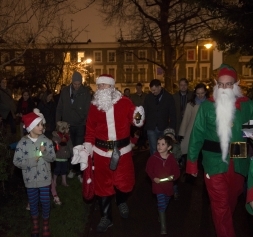 Friends and neighbours will be lighting up Arlington Square with community carol singing, mince pies, gingerbread and lashings of mulled wine and cider. Admission is free and everyone’s welcome. The Arlington Singers are tuning up, we’re busy preparing tempting local produce for your Christmas shopping and we’ve posted a letter up a chimney to invite a certain VIP. We’re also hoping that our very own Christmas elves Arl and Tonia will join us. Proceeds from this year’s Christmas Fair in the Square will go to two charities: Shelter from the Storm and St Joseph’s Hospice. Please join us from 3.30pm on the 13th. Bring a torch or a lantern and your heartiest Christmas singing voice. And check our website for contingency plans if it looks like a blizzard threatens. 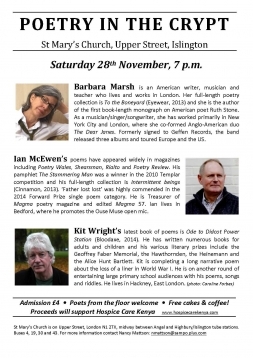 A quick reminder that Arlingtonia's poet in residence Ian McEwen is taking part in a fun poetry evening this Saturday. 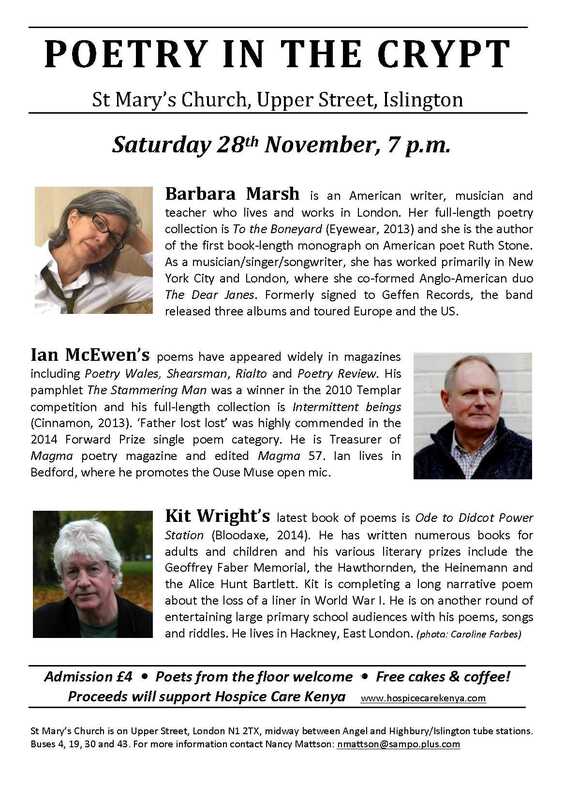 Poetry in the Crypt starts at 7pm, costs £4 and includes free cakes and coffee. 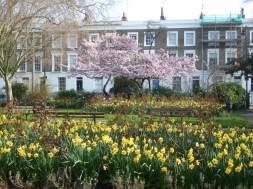 In a public vote, Arlington Square Gardens, in stiff competition with more than 1,500 of the nation’s best parks punched above its weight to be awarded 4th place. The winner was Victoria Park in Tower Hamlets, second place was Margam Park in Neath Port Talbot, South Wales, and in third place was Maidstone’s Mote Park. 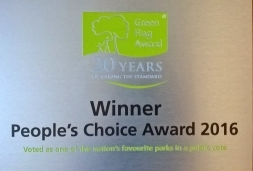 The People’s Choice competition is organised by the Green Flag Award scheme, which recognises and rewards the best green spaces in the UK and beyond. Arlington Square applied for a community green flag for the first time this year and received the highest banding possible from the judges. 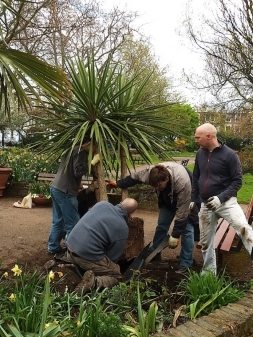 Arlington Square has been improved through community gardening organised by the Arlington Association, over the last 5 years community volunteers have raised funds and planted over 40,000 bulbs, plants, shrubs and trees making it one of London’s finest public garden squares. Gordon McArthur, Chair of the Arlington Association said "to be voted the 4th most popular greenspace in the UK is an amazing result and testimony to what community volunteers can achieve. Congratulations to our friends at Victoria Park, whilst we can’t aspire to a boating pond we do have plans to continually improve Arlington Square for the whole community to enjoy. Many thanks to everyone who voted for us". 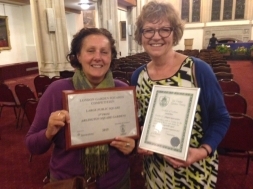 At the Islington in Bloom Awards at Islington Town Hall on 22 September we won Champion of Champions in the Best Residential Community Garden category. Many thanks to all our gardening volunteers who have worked so hard to make this award possible. Our Summer Fete was a great success and we made a record £4082.05 on Saturday. Thank you so much to everyone who worked so very hard to make this a Fete to remember and to Hyde Housing for sponsoring the band and to the worthy businesses who donated such great raffle prizes. Thank you too to all those of you who came along and splatted the rat, hit the coconuts, danced to the band, swooned to the harp, wrote with the poet, joined in the games, browsed the books, bric-a-brac and toys, scoffed the hog roast, cakes and lemonade, and took your chances with the Human Fruit Machine, the raffle and the tombola. Thanks to the hard work of our strong band of volunteers and everyone’s generous spending, we can help support four local charities (St Joseph’s Hospice, Shelter from the Storm, the Angel Community narrowboat and a new project with Mountainwise to engage local youths) and continue our Arlington Association’s work greening our neighbourhood. Preparations for the Arlington Square Summer Fete on Saturday 5th of September are progressing well. 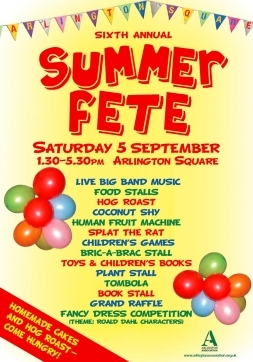 The fete is when we raise money for local good causes, to fund improvements to the planting in the square and the small amount of money we need to keep the Arlington Association functioning. The award winning Rees Street Community Garden was recently badly damaged by some careless scaffolders. 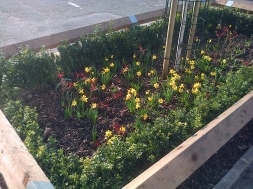 Thanks to Arlington Association volunteers the garden has been replanted and once more brightens-up Rees Street. Arlington Square Gardens is one of the very best public greenspaces in the UK – and that’s official. The square is among a record-breaking 1,582 parks and green spaces to receive a prestigious Green Flag Community Award – the mark of a quality park or green space. Gordon McArthur, Arlington Association Chair said: “We are absolutely delighted to receive a Green Flag Award for the first from Keep Britain Tidy. 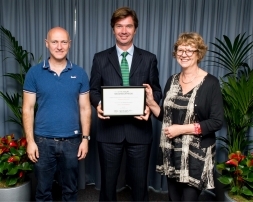 It is rewarding to know all the hard work off the Arlington Association’s volunteers to make Arlington Square a green oasis for the whole community has been recognised. It was particularly good to hear we have been judged to have met the standard required to be granted the highest level possible. It shows what a community can achieve when neighbours come together to improve their neighbourhood”. 33 Arlington Association volunteers have visited the garden of HRH, The Prince of Wales at Highgrove House in Gloucestershire. In November 2014 Prince Charles visited Arlington Square to learn about how our community gardening has transformed this public greenspace and helped to build a stronger community. 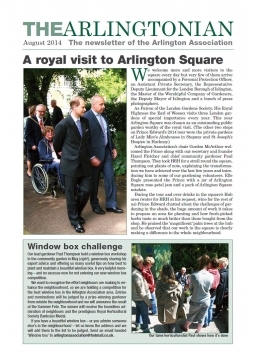 His Royal Highness was so impressed with what he saw in Arlington Square he invited our volunteers to visit his own garden at Highgrove House. 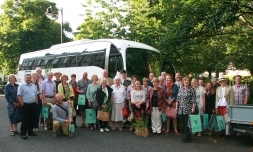 On the 22nd July a coach set off from Arlington Square to Highgrove, our volunteers were given a 2 hour tour of the garden which very much reflects HRH’s gardening interests and beliefs. We are pleased to announce poet Ian McEwen will be joining us as our Poet in Residence during Open Garden Squares Weekend, June 13 and 14 when he will be working with visitors to compose a poem about Arlington Square. Once again Arlington Square is taking part in Open Garden Squares Weekend along with over 200 squares and green spaces across London. We will be sharing our love for the square with neighbours and visitors. Come and enjoy the beauty of the square and hear about the improvements we have been making and our plans for the future. We will be offering refreshments to enjoy whilst you tour the square. For £6 you have access to all 7 gardens from 1.30pm to 5.30pm, all proceeds go to charity. These include Hospice UK, Marie Curie Cancer Care, Parkinson’s UK, etc. 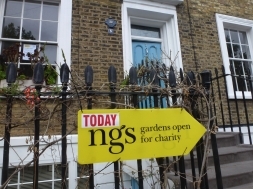 Last year we raised £1000 and overall the NGS raised over £2.5m. Tickets can be bought at any garden. Also at The Vicarage cocktails will be served, in return for a generous donation you can enjoy an Arlingtonian. Invented by our resident mixologist Panu Long, the Arlingtonian is a refreshing summer cocktail that evokes the spirit of Arlington Square and contains Crossbill Gin (distilled and donated by fellow Arlingtonian Jonathan Engels) with cucumber juice, a splash of ginger beer and bitters and a dash of lime/lemon juice. Again all profits go to support our work to green our neighbourhood. All this will be accompanied by live music performed by Fuzion, a cello and piano duo http://www.cellopianoduo.co.uk/ who will be performing in the vicarage garden from 2.30pm. Many thanks to Alison and Jeffery for another great edition. Suggests for article are most welcome so please email any to us. 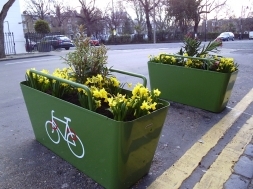 Bike Planters have been placed outside the Hanbury Arms on Arlington Square. This is a joint initiative between the Arlington Association, the Hanbury and Islington Council. They will be replanted several times a year by Arlington Association volunteers. Hopefully this will reduce the issue of patrons of the Hanbury locking their bikes to residents railings and bring more colour to the neighbourhood. This is a bit of an experiment and we will see how it goes, many thanks to Joe for organising and to Paul for arranging the planting. Holborn Studios on the Regents Canal will be holding an Open Day on SATURDAY, MARCH 14 2015, 11am to 4pm, FREE ENTRY. Helmut Newton famously once described Holborn Studios as the Abbey Road of Photography. World class image makers and double-A list personalities have been through the revered and very special photographic and moving image complex. • A guided Studio Tour where you will be able to not only view prints of some of the amazing images shot at Holborn but you will be able to see two or three live shoots - both stills and moving image. • See displays from the resident companies within the Holborn Studios Complex. • Attend presentations by photographers, film makers and historians. • Enter a free raffle to win a "Star for a Day" prize where leading professionals will style your hair, your makeup, your clothes and take a beautiful photograph of you. The prize will include collection and return to your home (London postal area) and a lunch for two. • See a selection of classic and collectors cars from the Classic Car Club. • Enjoy for one day only a 20 percent discount on all drinks, snacks and meals for the Commissary bar and kitchen. The Arlington Association’s work to green our neighbourhood has received a funding boost thanks to players of a charity lottery. The Arlington Association was awarded £1800 by People’s Postcode Trust, a grant-giving charity, funded entirely by players of People’s Postcode Lottery. The Arlington Association will use the money to improve the planting of Arlington Square and purchase tools for our community gardeners. Gordon McArthur, AA Chair said "This grant will help improve this precious public green space for the benefit of all the community". 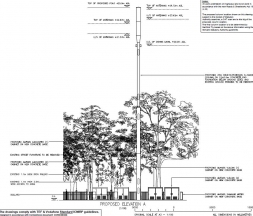 Proposals to construct a 25m mobile phone mast along with 4 large telecoms cabinets on the paved area outside of Union Square Gardens have been withdrawn. The Arlington Association worked with Ward Councillors, our neighbours on the Packington Estate and Hyde Housing to campaign against this proposal. We heard today that the proposal has been withdrawn and planning permission will not be sought. Our Christmas Fair in the Square was a great success, we were fortunate with the weather and everyone seemed to have a marvellous time. As with all these community events it takes a lot of organising and many people give up a great deal of time to make them a success. Particular thanks to Gail who masterminded the event, Carol for her generous donation of preserves, Alison and Jeffery for organising the singing, Rupert for playing the piano, James for sorting out all the logistics and being Santa and last but not least Ray and Lindsey for being our wonderful elves Arl and Tonia. Thanks to everyone else who helped on the day and donated cakes. Thanks to the generosity of Arlingtonians we raised an amazing £1000 for the Hackney Winter Night Shelter and just over £200 towards our work to green our neighbourhood. Many thanks to everyone who has helped in so many ways during 2014, it has been a great year. His Royal Highness, The Prince of Wales today visited Arlington Square to learn about our community gardening achievements and meet some of our volunteers. 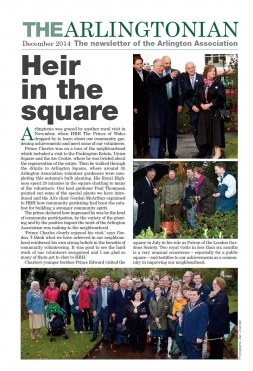 Prince Charles was on a tour of the neighbourhood which included a visit to the regenerated Packington Estate. After visiting Union Square and the Arc Centre where he was briefed about the regeneration of the estate he walked to Arlington Square. His Royal Highness spent 15 minutes in the square where around 25 Arlington Association volunteers were completing this Autumn’s bulb planting. Prince Charles spoke to many of the volunteers and commented on how impressed he was by the transformation the community had made to the gardens. Two royal visits in less than 6 months is an unusual occurrence and testifies to what we have achieved as a community in improving our neighbourhood. As part of our ongoing work to improve the planting of the beds around the square, we will be planting thousands of spring bulbs on Saturday 1st November from 10am. We have lots of bulbs of different types which will provide a magnificent display in the Spring, we really need community help to plant them so do please try to come along. Please bring a trowel and gardening gloves if you have them, if not we can supply. No gardening experience necessary. Tea and coffee will be served. Our 5th Summer Fete and the best yet. Despite showers in the morning which was not what the weather forecast said the sun shone for the fete and everyone had a great time. Massive thanks to all those who helped make Saturday such a successful community event, it was lovely to see Arlington Square full of neighbours and visitors having fun. Putting on such an event takes months of planning and it is only thanks to the generosity of neighbours giving up their precious time that makes it all possible. Thanks to everyone who donated cakes, books, toys, etc and to the local businesses who gave raffle prizes. Special thanks to Emma and Alison who worked so hard to coordinate our team of volunteers. 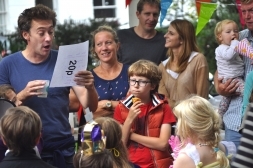 We have still to calculate the final tally of the funds we raised, but by any measure the 2014 Arlington Square Summer Fete was a triumph, thanks to you all for your support. We will be in touch about our Christmas Fair in the Square ……………. 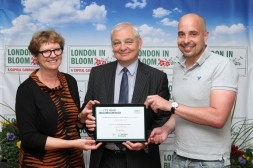 Today, at the 2014 London in Bloom Awards, our work to green our neighbourhood was recognised by the award of an Outstanding rating by the Royal Horticultural Society and London in Bloom. The RHS It's Your Neighbourhood Campaign recognises the work of community groups and only a very few ever achieve the top award of Level 5 - Outstanding. For the last 2 years we have been Level 4 - Thriving. 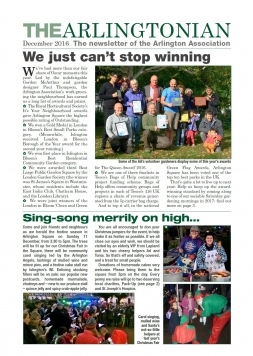 Each year over 250 London community gardening groups enter the campaign and are judged not only on horticultural excellence but other factors such community participation. 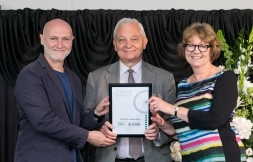 Our lead community gardener Paul Thompson-McArthur and AA committee member Alison Rice were at the awards at the Oval Cricket Ground and were thrilled to receive the award on the associations behalf. This award recognises all the hard work of our gardening volunteers over the last 4 years to improve the square and green our neighbourhood, Congratulations to all. Tickets are only £1 and can be bought at the raffle stall at the fete tomorrow. If your number is called and you are present you can select any available prize, if you are not present the prize highest on the list below will be awarded to you. Three Arlingtonian authors have kindly donated a copy of their latest books as prizes for our Summer Fete Raffle. Former journalist Hilly Janes in ‘The Three Lives of Dylan Thomas’ (The Robson Press), explores the legendary life and extraordinary legacy of one of the greatest British writers of the 20th century through the eyes of her late father, the artist Alfred Janes. Born in Swansea, like Thomas, he was the poet's great friend and painted the poet at three key moments, in 1934,1953 and, posthumously. 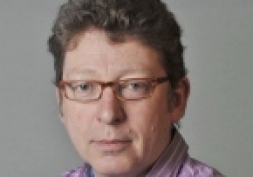 Barnaby Phillips, Europe Correspondent for the Al Jazeera News Channel, has his first book published on the 4th September. 'Another Man's War’ is the story of a Burma Boy in Britain's Forgotten African Army and is based on his Al Jazeera. documentary Burma Boy which won the prestigious CINE Golden Eagle Award. All three authors have signed their books. To stand a chance of winning this literary prize you need to buy our Summer Fete Raffle tickets, these will be on sale on the day at the fete. More wonderful prizes will be announced closer to September 6th. Tickets are £1 each. 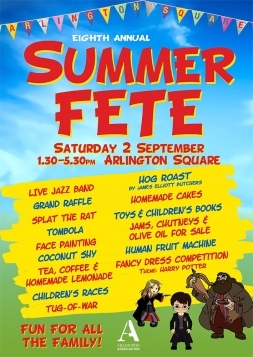 All proceeds from the Summer Fete will be used to support local good causes, continue our work to improve the Arlington Square Gardens and fund the small running costs of the Arlington Association. The homemade cake stall is always one of the star attractions of the Summer Fete. As with last year we are offering all you bakers recognition for your creations, and a chance to win a prize. Entries for the Fete’s great culinary competition can be anything baked – sweet or savoury, bread or patisserie, biscuits or muffins, a tart or a layer cake. 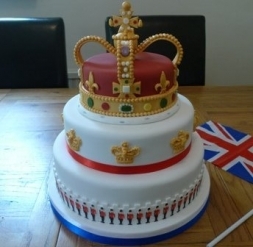 It must be award winningly tasty or be on a theme that relates to Royalty. To enter simply bring your masterpiece to the cake stall between 12.30 and 1.15 on Saturday 7 September. Make sure you add a note with your name, telephone number and the category you are entering. The entries will be judged at 1.30 on Fete Day and the winners announced at 1.55pm. Small Print: All entries must be homemade from basic ingredients by the entrant(s). 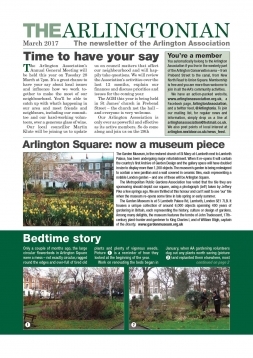 The latest edition of The Arlingtonian is being distributed and will shortly be popping through letterboxes in the neighbourhood. A colour version can be downloaded from here. Many thanks to Alison and Jeffery for another great edition. Summer Fete - 1 month to go! Preparations for the Arlington Square Summer Fete on Saturday 6th of September are progressing well. 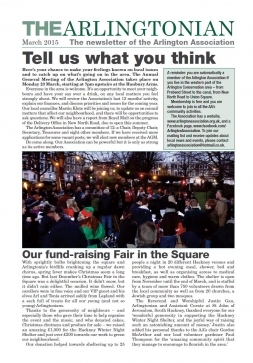 The fete is when we raise money for local good causes, to fund improvements to the planting in the square and the small amount of money we need to keep the Arlington Association functioning. 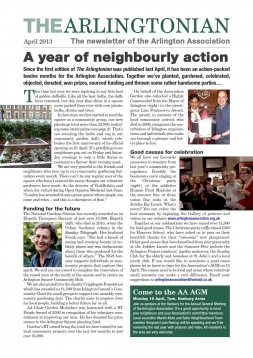 Greening our neighbourhood is at the heart of the Arlington Association. Each year there are more and more window boxes and we want to recognise the effort neighbours are making to enhance the neighbourhood. As part of the run-up to the Summer Fete we will be running the best window box competition. 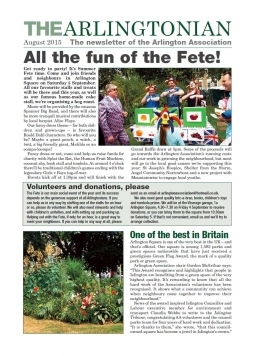 Entries and nominations will be judged by a prize winning gardener from outside the neighbourhood and the winner will be announced on the day of the fete. 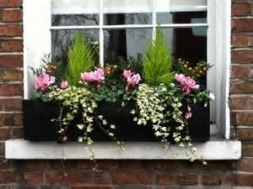 So if you have a beautiful window box or you admire one in the neighbourhood please send us an email on arlingtonassociation@hotmail.co.uk by 31 August 2014 with the address and we will add them to the list to be judged. The winner will be awarded the prestigious Royal Horticultural Society Banksian Medal. The visit to Arlington Square Gardens yesterday by Prince Edward was a great success, the square was looking beautiful and thanks to all the hard work by our volunteers and Greenspace there was not a blade of grass out of place. Everyone was very impressed by what we had achieved as a community. 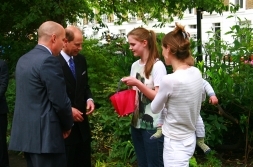 HRH was presented with a jar of Arlington Square Rose Petal Jelly and a pack of Arlington Square Notelets. Our Chair, Gordon McArthur was recognised for his volunteering work with the Arlington Association by his employer BT. Gordon was runner up in the Net Good category which recognises the contribution of BT people who are helping to make the planet a greener place. Gordon was presented with a donation of £500 by BT Chairman, Sir Mike Rake to support the work of the Arlington Association in greening our neighbourhood. 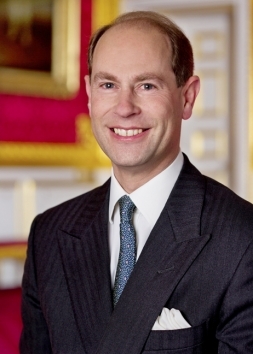 On the afternoon of Wednesday, 9th July, Arlington Square Gardens will host a visit by HRH Prince Edward, Earl of Wessex. His Royal Highness is patron of the London Garden Society and in this role will be visiting Arlington Square Gardens as it exemplifies the best in community gardening. During his visit, HRH will be given a tour of the gardens and will meet many of the Arlington Association gardening volunteers who have helped transform the gardens in recent years. It is expected HRH will arrive around 14.55 and spend around 25 minutes touring the square. For £5 you have access to all 5 gardens from 2pm to 5.30pm, all proceeds go to charity. These include Help the Hospices, Marie Curie Cancer Care, etc. Tickets can be bought at any garden. Refreshments will be served at the Vicarage and all proceeds from these will go towards supporting the Arlington Associations gardening activities. The photo we entered into the 50 Years of Britain in Bloom Photo Contest on Facebook secured the most votes in the Community Garden category. The photo was taken in January 2013 and shows Arlington association volunteers planting a mature palm tree that was rescued from landfill. The palm tree was from an apartment block on the river Thames that was undergoing extensive modernisation. 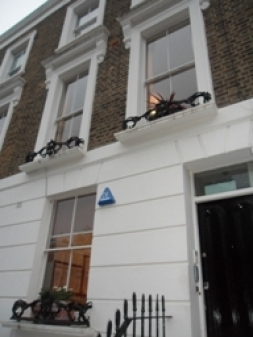 AA volunteers had to dig up 2 palms and lower them by ropes 2 stories onto a trailer, They were then transported through the city back to Arlington Square where they now thrive. We have won £300 worth of RHS Gardening vouchers which we will use to support our work to improve and maintain Arlington Square Gardens. 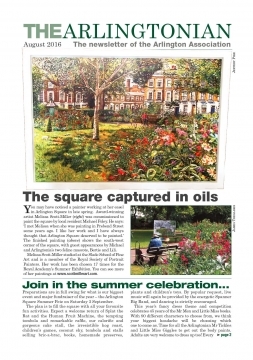 Once again Arlington Square is taking part in Open Garden Squares Weekend along with over 200 squares and green spaces across London. We will be sharing our love for the square with neighbours and visitors. Come and enjoy the beauty of the square and hear about the improvements we have been making and our plans for the future. We will be offering refreshments and selling the ever popular Arlington Association olive oil. London's oldest and best known photographic studios, Holborn Studios, have probably been saved from the demolition ball. The group of Victorian industrial buildings, which are just over the canal from the Arlington Conservation Area, received a Local Heritage Listing on 30th April 2014. 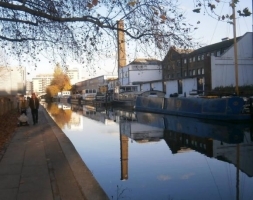 This listing combined with the Studios position within the Regents Canal Conservation Area means that developers will face enormous legal and social challenges if they continue with their attempts at total demolition. Holborn Studios was dubbed by Helmut Newton as "the Abbey Road of photography" and it has provided studios and facilities for the world's leading image makers, including David Bailey, Richard Avedon, Annie Liebovitz, Lord Snowdon, Terry O'Neil and John Swannell. 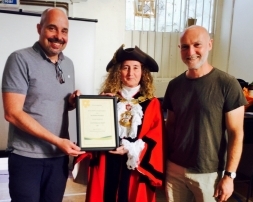 To mark the completion of the Arlington Square Community Hub, Penny Snell – Chair of the National Gardens Scheme presented Arlington Association lead Community Gardener, Paul Thompson-McArthur with a commerative plaque. The project was funded by the National Gardens Scheme 2013 Elspeth Thompson Bursary. Elspeth Thompson who died in 2010 was an enthusiastic supporter of the National Gardens Scheme and wrote a much loved ‘Urban Gardener’ column in the Sunday Telegraph. The bursary, administered by the Royal Horticultural Society supports horticultural based projects that benefit the community and develop and share a love of gardening. 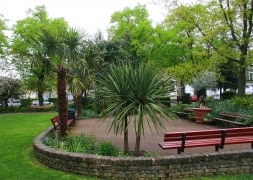 Arlington Association volunteers have transformed this space in the middle of Arlington Square Gardens. What was once trampled compacted earth are now beautiful beds with palm trees, cordylines, roses, alliums and nepeta. 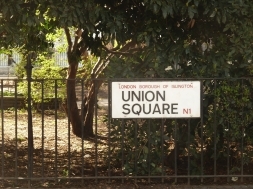 Union Square Gardens were officially opened today by the Mayor of Islington. After a major update the new landscaping and planting have made a huge improvement to the square. Arlington Association volunteers helped plant a new flower bed in the central grass area of the square. 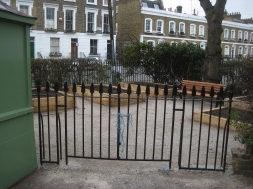 Works were funded by Hyde Housing and The Mayor of London Pocket Parks Programme. 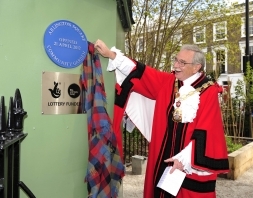 To celebrate the completion of the Arlington Square Community Hub we will be unveiling a commemoration plaque on Saturday 10 May at 12.30pm. This project was funded by the National Gardens Scheme 2013 Elspeth Thompson Bursary. Elspeth Thompson who died in 2010 was an enthusiastic supporter of the National Gardens Scheme and wrote a much loved ‘Urban Gardener’ column in the Sunday Telegraph. The bursary, administered by the Royal Horticultural Society supports horticultural based projects that benefit the community and develop and share a love of gardening. Over the last 12 months Arlington Association volunteers have transformed this space in the middle of Arlington Square Gardens. What was once trampled compacted earth are now beautiful beds with palm trees, cordylines, roses, alliums and nepeta. Poppy seeds kindly donated by London in Bloom have been scattered in the New North Road Pocket Parks to mark the centenary of the outbreak of the first World War. On August 4th 1914 Britain declared war on Germany. Four years later on 11 November 1918 Germany signed an armistice with the Allies bringing one of the deadliest conflicts in human history to an end. During the war there were over 16 million deaths and 20 million were wounded. 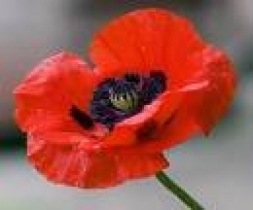 The poppy became associated with WW1 as it was the first plant that grew after the fighting on the barren battlefields of Northern France and Flanders. Our next Community Gardening Day in Arlington Square will be on Saturday 5 April, 2014. Thanks to a grant from the Biffa Landfill Communities Fund we have a number of shrubs to plant. As you can see from the photo to the right the square is looking magnificent this Spring. We will be in the square from 10.00am, please come along if you can spare some time, no gardening expertise needed. If you have gardening gloves and a trowel it would be good if you could bring them, otherwise we can supply. Tea, coffee and biscuits will be provided. All the family welcome. Join us for Arlington Association Annual General Meeting at the Hanbury Arms at 7pm on Monday, 31 March. We will be reviewing the past year and looking forward to the next 12 months. Our Ward Councillor, Martin Klute, will be present and will give an update on Islington Council and local issues impacting our neighbourhood. There will be an opportunity to ask questions. It is also a great opportunity to meet your neighbours over a glass of wine. Everyone who lives in our neighbourhood is welcome. Just two months after the Pocket Parks were planted the first daffodils are coming into flower. The roses are showing signs of new shoots and the ornamental pear tree in St Paul Street is in bloom. 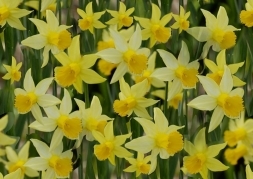 More daffodils will start to flower in the coming weeks as two types were planted, Tête-à-tête which is small, yellow and is flowering now and Actaea which is white, tall and should flower in April. Each year as a community we raise funds for local good causes through our Summer Fete and Christmas Party. We focus on 3 or 4 organisations that are local to our neighbourhood and where a donation of a few hundred pounds can make a real difference. In the past we have donated to local youth clubs, shelters for the homeless, Islington Proms Piano appeal, etc. If you know of a local good cause you think worthy of support please email us your suggestion. We will discuss the nominations at the Arlington Association AGM on 31 March and agree 3 to 4 to support during the next 12 months. Please send your nominations to arlingtonassociation@hotmail.co.uk by 24th March. The Canal and River Trust are working with Hanover Primary School to transform what is now an unloved patch of grass between the Pumphouse Cafe and Wharf Rd Bridge into a welcoming garden and more attractive space for the whole community to enjoy. As well as providing a valuable learning space for the children of Hanover School, the garden will encourage wildlife and biodiversity. It will be looked after by the children and school staff, local families, friends, neighbours and local businesses. All are welcome. Work on the construction of the garden planters began in February with planting starting in March. Volunteers are needed to help with filling the planters with soil, planting shrubs and trees and later with watering, weeding and general maintenance. Sat 22 March - to be decided, planting, watering, litter picking, etc. Fri 28 March - to be decided, planting, watering, litter picking, etc. Sat 5 April - to be decided, planting, watering, litter picking, etc. More dates to follow. 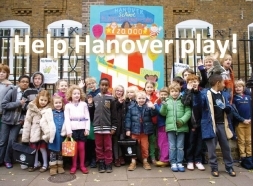 Email hsa@hanover.islington.sch.uk to join the mailing list and find out more. Come prepared for wet and cold weather. Bring tools, buckets, spades and gloves if you have some. Refreshments will be provided. Thanks to everyone who came along today to help with the Community Gardening, we achieved a lot. As you may have noticed Greenspace have pruned many of the large shrubs in the square and in particular in the westerly perimeter bed. This has given us the opportunity to plant more interesting shrubs that will give more interest and colour through the year. We made a good start today with the planting and will continue this to add new shrubs and plants in the coming weeks and months. The verbena in the rose beds was pruned and we now have a far better view of the daffodils which are now in full bloom. We also brought some colour to the Community Hub area by replanting the pots and you will see from the enclosed photo this has brightened up this area. Next Community Gardening Day is Saturday 5th April. Our next Community Gardening Day in Arlington Square will be on Saturday 1 March, 2014. Thanks to a grant from the Biffa Landfill Communities Fund we have a number of shrubs to plant. As you can see from the photo to the right the square is starting to look very colourful. We will be in the square from 10.00am, please come along if you can spare some time, no gardening expertise needed. Our lead community gardener Paul Thompson-McArthur has planted some cherry, pear and plum trees in the Community Garden. These will add year round structure plus provide some delicious fruit in the early Autumn. In coming weeks a selection of gooseberry bushes will be added as well. It is planned the herb beds will be replanted as having fresh herbs on the doorstep is a popular request from neighbours. 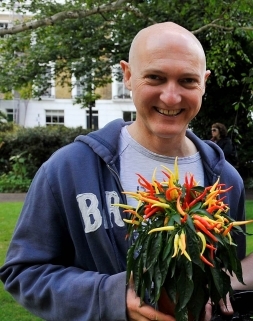 This Saturday (8th) will be our first Community Gardening Day in Arlington Square of 2014. Thanks to a grant from the Biffa Landfill Communities Fund we have a number of large shrubs to plant, we also a good deal of tidying up to do in preparation for Spring. There are already daffodils coming into bloom as well as snowdrops, so you can enjoy the benefits of the mild weather. We will be in the square from 10.00am on Saturday, please come along if you can spare some time, no gardening expertise needed. 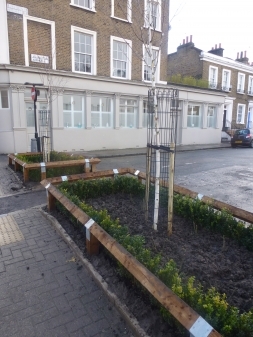 Planting of the New North Road Pocket Parks was completed yesterday. Many thanks to everyone who helped, over the last 2 weekends we have planted over 80 roses, 2000 daffodils, 80 metres of box hedging, spread 1000 litres of farmyard manure and dressed each park with bark chips. Personally I think these are a real addition to our neighbourhood and as one neighbour remarked they will make lovely gateways to Arlingtonia. A few neighbours have asked again about emergency service access. 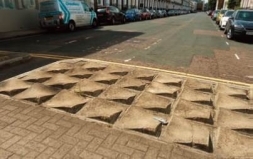 Before we embarked on the project we and the Council both checked and were given absolute assurance that the emergency services would not try to take vehicles over the castellated paving and that they had no objections or concerns about the castellated paving being removed and the pocket parks installed. Thanks to those who have already volunteered to water and help keep the parks clear of litter, watering will be very important come the spring and summer, we would really appreciate if those neighbours closest to the parks to pop out with a can of water on a regular basis. Though for the time being, lack of water is not a worry. My personal thanks goes to Martin Klute our ward councillor, without his help this project would never have come to fruition. 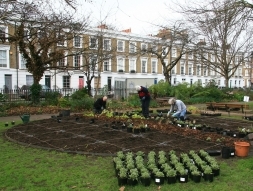 Our next community gardening day in Arlington Square will be on Saturday, 8th February. Many thanks to all those who helped today to plant the roses and daffodils in the New North Road Pocket Parks. We planted over 80 roses and 2000 daffodils. Each street had a different rose planted, come spring the daffodils will provide a magnificent display after which the roses will start to flower. Two types of daffodil were planted in all the Pocket Parks, Tête-à-tête which is small, yellow and normally flowers in March and Actaea which is white, tall and flowers later in April. However, having been planted late and seeing the weather is so mild who knows when they will bloom this year. Next Saturday we will plant box hedging around the perimeter of each area, as today we will kick-off at 10am in Arlington Avenue. 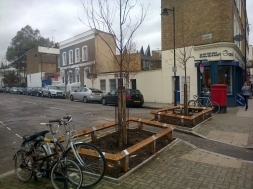 New trees in Rydon Street and St Paul Street Pocket Parks have been planted. 2 Cherry Trees in Rydon Street, Prunus serrula 'Tibetica' and 2 ornamental Pear Trees in St Paul Street, Pyrus calleryana 'Autumn Blaze'. On Saturday 11th January from 10.00am there will be a big community planting day, each Pocket Park will be edged with box hedging, have roses and daffodils planted. This a major project and we will need volunteers to help. More details will follow in early January but please put the date in your diary. All this has been made possible by a grant from The Big Lottery and a grant from the Council Local Initiatives Fund which receives money from local developments in our ward as part of the condition for planning consent. Our local Ward Councillor, Martin Klute has been invaluable in helping to get all the council departments aligned to support making this happen. It has been an 18 month journey and it will be good to see it all come to fruition and further green our neighbourhood. Our first Christmas Fair in the Square went very well, the weather stayed dry for most of the event and the turn-out was excellent. We raised £300 for our nominated local good cause, CHUG, the money will be used to educate local children about the canal. We also raised just under £400 to support our work to green our neighbourhood. Thanks goes to everyone who helped make the event a great success. 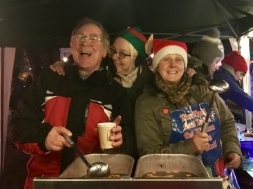 We are also very grateful to the grant from Groundwork that funded much of the event and allowed us to decorate the square with fairy lights and have some very well dressed elves. Our very first Chistmas Fair in Arlington Square is under two weeks away and plans for Sunday, 15th December at 4pm are in full swing. As is now the tradition at events in the square there will be a cake stall selling homemade produce, the money we raise will be used to make the square even more beautiful. Please help with donations of Christmas treats, preferably individual seasonal goodies such as gingerbread men, cookies, chocolate logs (sliced up) or savouries such as sausage rolls and cornish pasties would be great. We will be supplying free shop bought mince pies and mulled wine in return for donations to raise funds for a worthy local good cause. We'll only be open for an hour and a half , so it won't be as lavish as world famous summer fetes but hopefully as successful and enjoyable! Donations can be brought to the square from 3.30pm on the 15th or email arlingtonassociation@hotmail.co.uk to arrange delivery or collection in advance. The first trees have been planted in the New North Road Pocket Parks. Arlington Avenue had two Himalayan Birches planted and Linton Street was planted with two Tulip Trees. 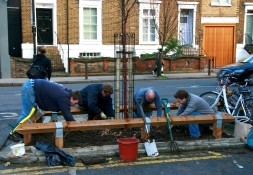 Rydon Street will be planted with two Tibetan Cherries and St Paul Street with two Callery Pears soon. During January we will organise a Community Planting Day to complete the transformation of these areas by planting box hedging, roses and spring bulbs. As part of our on-going work to restore the rose beds in Arlington Square, 30 bare root roses have been planted to fill the remaining gaps. These rose beds were planted in the 1950's and were in a very poor state of repair 3 years ago. Since the Arlington Association started to restore the beds over 140 new roses have been planted in the beds. Just 2 years ago you could have easily walked through the rose beds but now they are densely planted and look magnificent in Summer. Thanks to Paul, Richard, Marco, Michael and Jacky for planting the new Carris roses which is a lovely red rose. 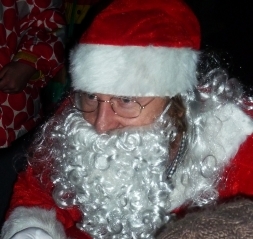 pies, Christmas goodies, some lusty communal carol singing and the chance for children to meet a Very Special Guest. 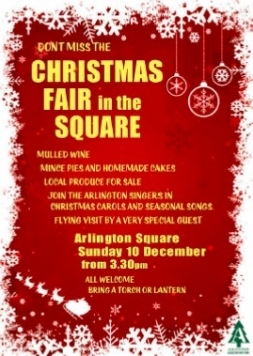 There’ll be free glow-sticks for the first 150 guests, fabulous festive home-made cakes and an opportunity for some Christmas shopping, with Arlington Square cards, olive oil, chutneys and other Arlington produce on sale. Donations collected in return for the mulled wine and mince pies will go to the Canals in Hackney Users Group which is based in Kingsland Basin. CHUG will be engaging with local children to inspire them about canals past and present. Funds raised from the sale ofcakes and Arlington produce will further support our efforts to green our neighbourhood. Everyone is very welcome on the 15th, especially children. Do bring torches or lanterns – and keep an eye on our website and emails for any last-minute change of plan if blizzards, storms, hail or monsoons threaten. This year’s special Arlington Association Christmas party has been made possible by a generous grant from Groundwork’s Celebrate Your Space fund supported by the National Lottery. We wish Paul every success for this well-deserved nomination. 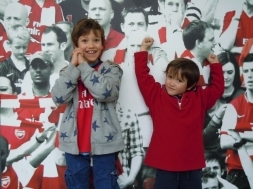 Thomas and Maxi Stiastny Williams enjoyed a tour of the Emirates Stadium, home of Arsenal FC through the good fortune of winning a raffle prize at the Arlington Square Summer Fete. Arsenal generously donated the prize and the brothers had a wonderful day where they got to see the players changing rooms, the press centre and lots of other aspects of the stadium not usually open to the general public. This weekend was extremely busy on the gardening front. 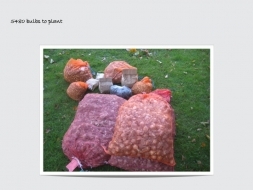 Not only did we spread 15 tonnes of compost around the square but we planted over 5000 Spring bulbs. Many thanks to everyone who helped through heavy rain and brilliant sunshine. The square should look great next spring. Our thanks goes to The London Community Foundation for their support which in part made the purchase of these bulbs possible. 15 tonnes of compost were delivered to Arlington Square today. With the help of 3 Park Rangers and about 8 AA volunteers the 15 tonnes was moved into the square and spread over the beds. It took over 4 hours of hard work and we are very grateful to the Park Rangers and volunteers for their dedication to help improve the square. The compost is the recycled green waste the Council collect each week. It will help improve the soil in the square. 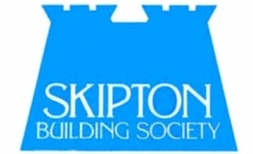 Good news, it is just been announced we are one of the lucky recipients of a £500 award from the Skipton Building Society. The Skipton Building Society is 160 years old and to celebrate this they are awarding grants to 160 community groups across the UK. Over 1000 community groups applied and awards were given based on the number of online votes received. Many thanks to all who voted for us. The money will be used to further enhance Arlington Square. A reminder our next community gardening day is our annual Big Bulb Plant on Saturday 9th November. 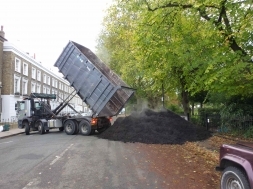 On Friday 8th we will be having 10 tonnes of recycled green waste compost delivered and will need help from 10am on Friday to spread round the beds in the square. Tomorrow night is Halloween, it is great fun for many but some neighbours do prefer to be left in peace. It was suggested we circulate some tips gleaned from the web for making sure it is a good evening for all. Use them as you see fit. 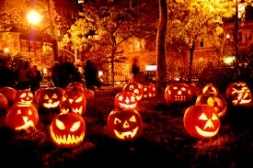 Only approach homes that have a visible “invitation” – a recent trend if for people to display a pumpkin, lantern or other Halloween decorations to show they welcome a Halloween visit. It is best not to knock if the lights are off and don’t knock more than once. Alternatively, you may decide to knock only on doors of friends and neighbours that you have pre-warned of the visit! What if my Children Don’t Like the Treat? Everyone loves a polite visitor so it is suggested your children are briefed to say “please” and “thank you” in addition to “trick or treat,” plus they should try to be appreciative of any treat they are given. What’s the Trick All About? The word "trick" refers to the "threat" to perform mischief on the homeowners or their property if no treat is given. These days it is uncommon to have raw egg splattered over your door by pranksters, but it’s safest not to answer the door to raucous groups of older teenagers, or if you suspect your visitors are not well-intentioned. If you are asked for a “trick,” what should you do? One harmless but funny idea is to get the homeowner to close their eyes and put their hand in a witch’s hat or toy cauldron filled with a gooey mess or plastic spiders, rubbery worms and insects. We hope everyone has a fun and safe evening. We are pleased to announce we have been given a Biffa Award to fund our work to improve the planting of Arlington Square. Over the last couple of years our community have worked hard to improve Arlington Square Gardens and make it a green oasis in the heart of our neighbourhood. This generous award of £4000 will be spent over the next 12 months to buy bulbs, plants and shrubs to be planted at our regular community planting days. 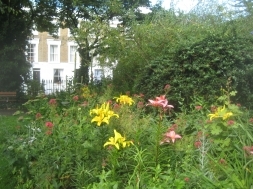 As part of the Royal Horticultural Society’s Wild About Gardens Week we will have a special community planting day on Saturday, 26th October at 10am in Arlington Square. 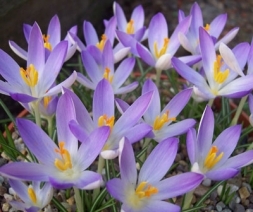 The RHS have kindly given us 500 crocus bulbs to plant, plus we will be planting some shrubs. Do join us if you can, bring a trowel and gloves if you have them, if not we can supply. Our Big Bulb Plant will take place on Saturday, 9th November and we will have 1000’s of spring bulbs to plant, more details to follow nearer the time. Excavation in Arlington Avenue has started today in the process to create the New North Road Pocket Parks at the junctions of St Paul Street, Rydon Street, Linton Street and Arlington Avenue with the New North Road. Highways will excavate the castellated paving and back fill the area with soil and construct wooden knee barrier fencing around the areas. Next phase is for the Council Tree Service to plant a tree in each area (2 per street). Finally, we as a community will plant hedging, bulbs and shrubs to create the Pocket Parks. This has been made possible through grants from The Big Lottery, Awards for All programme and the Council Local Initiatives Fund. It has been a long and challenging process to get to this point and it would not have been possible without the support of our Ward Councillor, Martin Klute. It will be very important the trees and planting are watered. If you live near these areas and can help keep the new planting watered during next Spring and Summer please do get in touch, this is really important and we would like a team of neighbours in each street to look after the Pocket Parks. We will keep you posted on progress, we expect the trees to be planted before Christmas and we will arrange a community planting day to plant the box hedging, bulbs and plants – more details to follow. It is great to see our neighbourhood further greened and improved. Our first community gardening day of Autumn was a great success. Not only was the westerly perimeter bed given a makeover but we were able to celebrate a season of gardening awards and accolades with a community picnic. Thanks to local mixologist Panu Long thirsty gardeners were able to satisfy their thirst with cocktails that included herbs from the Arlington Square Community Garden. The event was made possible thanks to a grant from Groundworks through their Celebrate Your Space programme. The first Great Arlington Bake-off was a triumph and the creativity and baking powers of Arlingtonians was an impressive sight to behold. Amy found the judging challenging as the standards were so high. 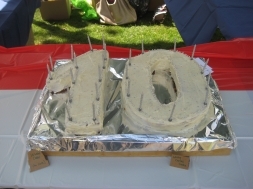 Thanks to everyone who entered and to everyone who made a contribution to the Cake and Savouries stall making it the biggest fundraising stall of the fete. Wendy sends her heartfelt thanks for helping to make Cakes and Savouries such a success. 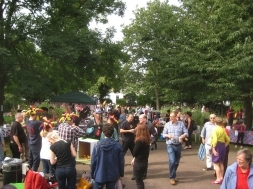 Our Summer Fete was a huge success with a record turn-out. Thanks to everyone who staffed the stalls, baked cakes, moved tables, hung bunting, entered the art competition, made jam and the hundred and one other things that made Saturday such a great community event. Thanks to the generosity of everyone we have raised £3000 for local good causes and improving Arlington Square. Summer Fete tomorrow - donate today! Marco, Alison and Richard will be at the Vicarage Garage at 1A Arlington Square from 4pm to 7pm today to receive donations and we will be in the square on Saturday from 10.30am. The success of the fete depends on your generosity so please get looking through your cupboards. The homemade cake stall is always one of the star attractions of the Summer Fete. So this year on Saturday 7th September we are offering all you bakers recognition for your creations, and a chance to win a prize. 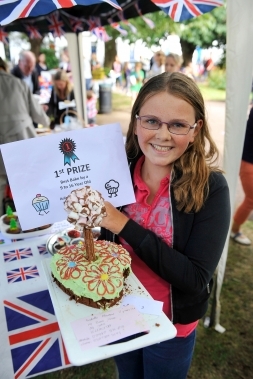 Entries for the Fete’s great culinary competition can be anything baked – sweet or savoury, bread or patisserie, biscuits or muffins, a tart or a layer cake – but it must have a theme that relates to gardens or gardening. To enter simply bring your masterpiece to the cake stall between 1pm and 1.30 on Saturday 7 September. Make sure you add a note with your name, telephone number and the category you are entering. The entries will be judged by the President of the London N1 Women’s Institute at 1.30 on Fete Day and the winners announced at 1.55pm. 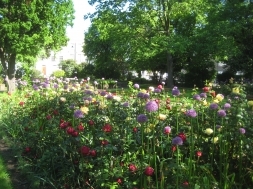 Can you capture the beauty of Arlington Square Gardens? We are holding an art competition and plan to display the winning artworks at the Summer Fete on 7 September. They will also be exhibited in the Hanbury Arms for the rest of September and featured in the Arlington Association calendar planned for 2014. The entries will be judged by a panel of local award-winning artists on Friday 6 September and the winners announced at the Fete on 7 September. Prizes include vouchers from Cass Art. To enter, simply portray a scene from Arlington Square Gardens in any medium except photography. Deliver your work to the Hanbury Arms, Linton Street, Arlington Square N1 7DU on Tuesday, Wednesday or Thursday, 3,4 and 5 September. Please write your name and phone number on the back of artwork along with the category you are entering. All artworks must be A2 or smaller, landscape format and unframed. The Arlington Association retains the right to reproduce any artwork in the fundraising calendar or any other not-for-profit purposes. It is the responsibility of every artist to collect their own works from the Hanbury after 14 October 2013. Arlington Association is not responsible for any lost, stolen or damages submissions. The Arlington Project is located on Arlington Square and provides residential accommodation for six adults with learning disabilities. The Arlington Project benefited from a donation last year of £150 from the proceeds of our Summer Fete and has been selected as one of our good causes for 2013. The money is being used to give their back garden a bit of a makeover and four Arlington Association volunteers are leading on this. Attached is the latest Newsletter from the Arlington Project, it gives a little update on the six service users. Margaret the manager, the service users and the staff are all very appreciative of the work the Arlington Association is doing and feel much more engaged with the local community in which they live and work. Four local gardens opened this weekend as part of the National Garden Scheme’s Garden Festival Weekend. 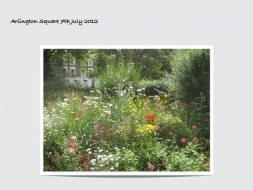 121 visitors saw four very different styles of garden as well as visiting Arlington Square. £751 was raised for charity including Help the Hospices and Marie Curie Cancer Care. Our sincere thanks to our small band of hard-working volunteers, bakers and makers who helped make our participation in the London Open Garden Squares Weekend such a success. We welcomed an estimated 500 visitors over the weekend. Many of the Open Squares ticket holders were seeing Arlington Square for the first time. They travelled from near and far, including Dalston, Greenwich, Shepherd’s Bush, Scotland, Essex, Hampshire and Norfolk. One family group was visiting from Sydney, Australia. The former Major of Islington who opened our Community Garden last year was impressed by its flourishing progress. So were the Open Squares organizers, BBC Radio London’s gardening journalist and Britain’s leading garden attractions expert. We admit to thoroughly enjoying all the praise we received. On Saturday 1st June we will be holding our last community gardening day before we participate in Open Garden Squares Weekend 2013. Please come along and help us prepare the square for our visitors. We will be doing some planting, weeding the beds, trimming the hedges and giving the square a little bit of extra TLC so it is looking at its best for the following weekend. The square official opening times for OGSW are Saturday 8th June 10.00am to 5.00pm and Sunday 9th June 2.00pm to 5.00pm. We will be providing refreshments, cakes, tours and on Sunday afternoon we will have a pop-up Gin Garden where visitors will be able to sample gin cocktails flavoured with ingredients from our community garden. We will also be selling the very popular Arlington Association Olive Oil which is a great vintage this year. We look forward to sharing with visitors the fruits of our labours over the last 12 months including the newly created Arlington Square Community Hub which has been made possible through the generosity of the National Garden Scheme Elspeth Thompson Bursary which is administered by the Royal Horticultural Society. Arlington resident Dan Exelby was diagnosed with Leukaemia in May 1986 when he was 14 years old. At the time he was given a 50:50 chance of survival. After three months in hospital and nearly two years of outpatient treatment doctors told him he was clear of the disease. 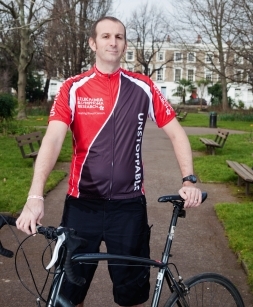 The summer of 2013 marks the 25th anniversary of Dan being given the all clear and to commemorate this he and a group of friends are cycling through 25 counties in England, roughly 80 miles a day for seven days, to raise money for Leukaemia and Lymphoma Research. Many thanks to everyone who turned out to help with the big tree plant today. 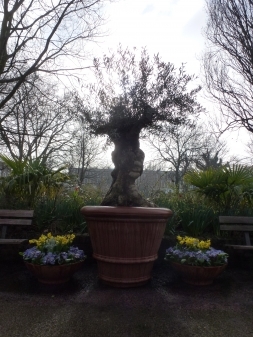 As part of our work to create the Arlington Square Community Hub we planted a new olive tree in a large terracotta pot. The tree is around a 100 years old and makes an impressive focal point at the top of the central avenue. We also replaced the dying cordylines that we had rescued in January from Rennies Court. Unfortunately we found out afterwards Cordylines have tap roots and hate to be move so seldom survive being dug up and transplanted. Thanks to the Elspeth Thompson bursary we were able to replace them with impressive 3 stem Cordylines that not only restore symmetry but helps add to the Mediterranean feel of this area. We think the palm trees also rescued from Rennies Court are doing ok and we have our fingers crossed for the other olive trees. We will continue to improve this area at the next community gardening day on Saturday 11th May. 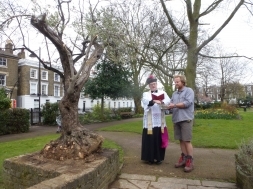 Two new olive trees are now located in Arlington Square. Kindly donated by James who brought them back from his olive grove in Spain overnight on Friday (not in is hand luggage). Many thanks to the strong volunteers who helped plant them, it was not an easy task as the root system was far bigger than the beds they were destined for. We had to deploy chainsaws, conventional saws and brute strength to get them into their new spot. We hope they will survive as they are very old, the current trees were grafted in the 1700’s but the roots are far older. As we felt the move to London and the root “trimming” had been a bit of a shock, we thought we should maximize their chances of survival and pray for divine intervention, as the Chancellor and Vicar General of the dioceses of Bristol was on hand, known to you and me as our neighbour Justin Gau we asked him to pop over and bless them. You can see the easterly olive, Justin and James in the enclosed photo, more can be seen on our Facebook page at facebook.com/ArlingtonAssociation, and in time there will be a video on this website. Should they perish we will replace them with smaller trees. The Arlington Association was shortlisted in the City of London Growing Localities Awards in the Reclaiming and developing wasteland category for our work on the Arlington Square and Rees Street Community Gardens. Whilst we were not the winner this shortlisting amongst 97 nominations recognises the efforts of the Arlington Association to green our neighbourhood. “I am pleased to have been invited by the City of London Corporation to be Patron of its City Bridge Trust’s Diamond Jubilee Grants Programme, “Growing Localities”. The Extent of the City of London Corporation’s charitable activity is renowned and I am delighted that through this Programme, City Bridge Trust is encouraging local neighborhood projects which will help the environment and offer work training opportunities for young people. I commend this programme to community groups and the many other charities that do such valuable work throughout London. Their commitment to improving the quality of life and maximising the life chances of some of the most disadvantaged groups in our society is of benefit to all. I wish the City of London Corporation, its City Bridge Trust and prospective applicants every success with this initiative. Tomorrow evening (Saturday 9th) the second season of the Islington Proms commences. A Proms Committee has been established and several of our members sit of this. 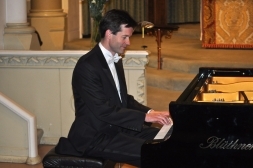 Our neighbour Rupert Egerton-Smith who plays the piano at our annual Christmas Party will be giving a recital on Saturday 29th June. The Proms Committee has taken the brave decision to purchase a Bechstein Grand Piano for use at the Proms and other community events. The piano cost £5000 and the Proms Committee are looking for local people to help fund this purchase either through a donation or the innovative idea of a community loan. The attached flyer gives more details but essentially local people are being asked to give an interest free loan to The Islington Proms for a period of around 3 years. When the Proms have made sufficient profit the loans will be paid off. We are seeking nominations for local good causes to support this year. Our criteria is they should be local to our neighbourhood and where a small donation of around £150 will make a real difference. Nominations should be sent to arlingtonassociation@hotmail.co.uk The Arlington Association committee will select a shortlist for agreement at our AGM in April. We use some of the funds we raise at our events such as our Summer Fete to support local good causes. 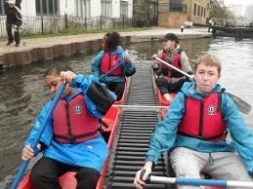 Previously donations have been made to The Arlington Project, The Waterside Youth Club, Islington Proms, Islington Boat Club amongst others. 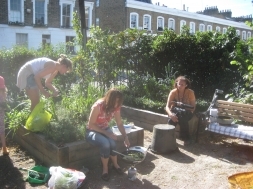 The attached MP3 file is from a Radio London programme broadcast yesterday on Community Gardening. An Arlingtonian felt inspired to call in and share what we have been up to as a community. 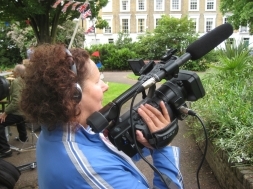 So enjoy the 7 minutes of Alison extolling the virtues of community gardening in Arlington Square. We are pleased to announce the Arlington Association has been awarded The National Gardens Scheme 2013 Elspeth Thompson Bursary. 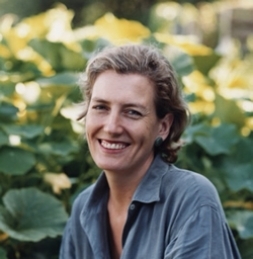 Elspeth Thompson who died in 2010 was an enthusiastic supporter of the National Gardens Scheme and wrote a much loved ‘Urban Gardener’ column in the Sunday Telegraph. The bursary, administered by the Royal Horticultural Society supports horticultural based projects that benefit the community and develop and share a love of gardening. We will be using the bursary to continue our work to improve the raised area at the centre of the north of the square (where the rescued palms are). Elspeth’s husband Frank commented ‘She had a knack of seeing and creating beauty in unlikely places and was enthusiastic about those who gardened for the benefit of others’. 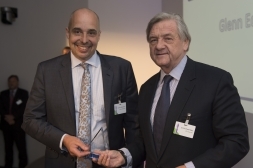 We hope that what we are creating as a community in Arlington Square will make us worthy recipients of such a prestigious award. We plan to have everything complete in time for our participation in Open London Squares Weekend and National Gardens Weekend both of which take place in June. 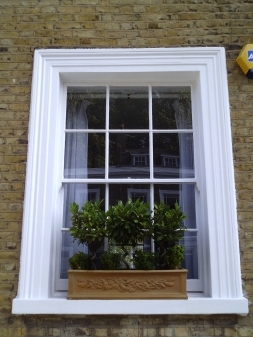 Two new pots were added to the southerly end of Arlington Square over the weekend. Planted with spring plants and bulbs these bring some added colour to the seating area in the south. Thanks to all those who turned out to help at our first official Community Gardening Day for 2013. The rose beds have been tied and at the north of the square we have opened up views and planted some interesting flowering shrubs that will grace the square in the years to come. Next Community Gardening day is Saturday 6th April. The Arlington Association was honoured last night at the Lisa Pontecorvo Awards ceremony at the Town Hall hosted by the Mayor of Islington. 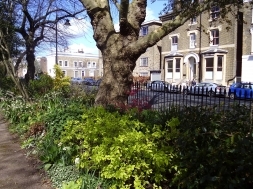 The Arlington Association had been shortlisted as a finalist for this prestigious award for our work in building a stronger neighbourhood and improving Islington’s green spaces (Arlington Square). We were one of two runners up and the overall winner was Dianne Browning, Chair of Friends of Barnard Park. 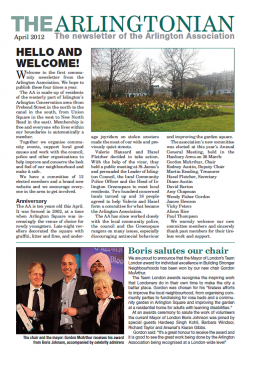 It is good to see our work being acknowledged borough wide and our thanks goes to everyone who has helped make our community and gardening activities such a success. Lisa Pontecorvo was an active community and environmental campaigner in Islington who was tragically killed in 2008. 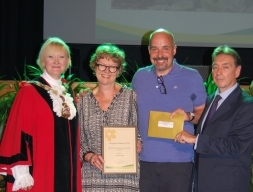 The award established in her memory recognises the contribution of organisations and individuals in Islington who make our borough a greener and better place to live. Our award certificate is proudly displayed on the noticeboard beside the Community Garden in Arlington Square or can be viewed on this page. The Arlington Association is sorry to report the death of a famous and interesting former neighbour. Born in 1922, Paul Hansard had fled Hitler’s Germany as a child. He worked as an actor, initially with the RSC at Stratford. He gained many film and stage credits and lived in Arlington Avenue. Paul found his real vocation as a one man puppeteer, sparked off by a season at the Little Angel Theatre. His show Johnny and Flonny, about a rabbit and a little boy, was shown weekly ITV’s Small Time when the channel first launched in 1955. Between 1971 and 1994 Paul Hansard created 13 shows, gave almost 4000 performances and made over 200 puppets, some of which are now part of the collection at the Victoria and Albert Museum of Childhood. In 1956, Paul met and married Valerie and they bought 24 Arlington Square. They moved on in 1976, but in 1995 decided to come back to the area and amazingly found the same house on the market, so bought it again and remained here 2011, when they moved up to a flat in the old Highbury Stadium, a great irony for a lifelong Spurs supporter. Paul died in January 2013 and leaves behind his wife Valerie, two sons and five grandchildren. Many of us will remember Paul as a familiar figure out in Arlington Square in fine weather, though usually in a heavy dark coat, sitting on a bench, chatting to his neighbours. Paul and Valerie were well known members of our community, who were dedicated to the local area and loved the gardens of Arlington Square. 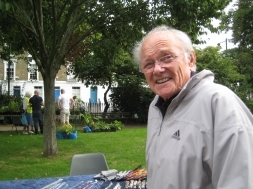 The picture shows Paul in the gardens on the day of the first Arlington Square Fete. Over the weekend Arlington Square has seen a transformation and you may feel as you stroll through the square you have been transported to the South of France or Los Angeles. The raised area at the north of the square in now graced by 8 foot palm trees and a couple of very tall cordylines. Additionally, a host of new plants and shrubs have been planted including a witch hazel, magnolia and a camellia to name just a few. All this has been made possible by the generosity of the residents of Rennies Court which is located just south of Blackfriars Bridge. On Wednesday we heard that there was a huge number of trees, shrubs and plants going free for any community group that wanted them. The reason is that Rennies Court is undergoing a major redevelopment which means there communal garden is going to be ripped up and everything will be sent to landfill. A quick visit on Thursday morning revealed a treasure-trove of trees, shrubs and plants and we knew the perfect spot for many of them in Arlington Square. An Arlington Association Plant Rescue Squad was mobilised and on Saturday and Sunday we rescued 2 trailer loads of trees, shrubs and plants which are now planted in the square. As you will see the raised area at the north has been transformed. On sincere thanks go to our friends at Rennies Court for being so community spirited in wanting to ensure the plants they have loved and enjoyed went to a good home. Huge thanks to James, Marco, Richard and Paul who joined me in the rescue. At times we thought we had bitten off more than we could chew but with determination and James's mountaineering skills (you will need to see the video) we triumphed and brought a fantastic selection back to the square. 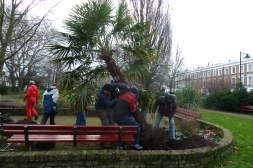 Also thanks also to everyone who helped on Saturday spreading compost and pruning the circular beds, the team of strong men who helped plant the palms and everyone else who helped today with planting and tea making. In our continuing effort to improve our communication we are proud to launch our Facebook page facebook.com/ArlingtonAssociation So we now have many bases covered, we have a good old fashioned noticeboard in the square, our quarterly newsletter The Arlingtonian, our email updates, this website and now Facebook. You never know we may get Hazel tweeting soon. Make sure you “like” us. We have put many photos from our community events and our projects and will make an effort to add more. Thanks to everyone who joined us last night at the Hanbury for the Arlington Association Christmas Party, we raised via the raffle £385 for the Hanover School Playground Appeal. 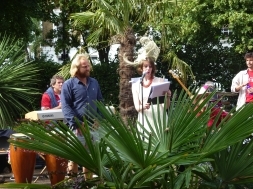 Special thanks to our pianist Rupert Egerton-Smith, The Arlington Singers and all those who donated raffle prizes. Also thanks to the Hanbury for hosting the event and the mulled wine. A video of the event can be seen in the Gallery page of this website. 2012 has been a busy year, 12 Community Gardening Days, the opening of the Community Garden, the Diamond Jubilee Big Lunch, our participation in Open Squares Weekend and our Summer Fete. On behalf of the Arlington Association Committee we wish all our neighbours best wishes for the festive season and we look forward to a busy schedule of community events in 2013. Many thanks to all those who came along today to help with our “emergency” community gardening day, we were blessed with good weather and planted 4750 spring bulbs kindly donated by Taylors Bulbs and facilitated by the Metropolitan Public Gardens Association. We also planted a number of shrubs that will enhance the square in the years to come. 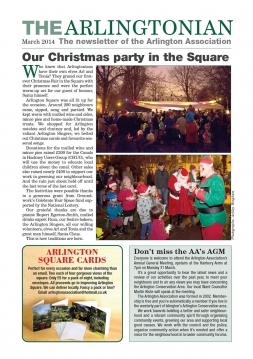 This brings us to 12,230 bulbs planted in the square this Autumn and a good reason to celebrate at the Arlington Association Christmas Party tomorrow night. 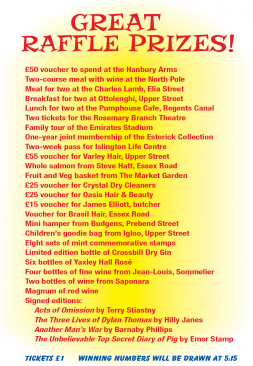 We have a great selection of prizes in our Christmas Raffle in aid of the Hanbury School Playground Appeal. 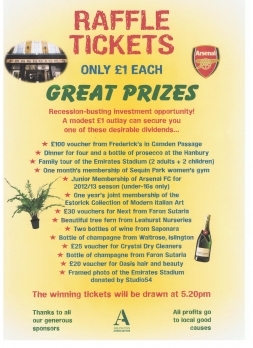 Tickets will be on sale at our Christmas Party at the Hanbury Arms from 5pm on Sunday 9th December. Tickets are £1 each and all the proceeds go towards the playground appeal. Many thanks to all those who have donated prizes. 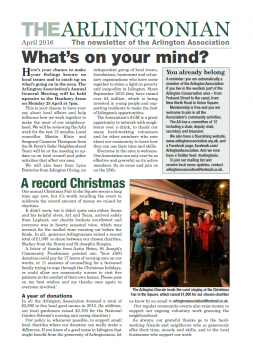 A black and white printed edition of The Arlingtonian will be distributed door to door over the coming week to the 600 homes in our neighbourhood. A colour version can be downloaded by clicking on the file below. 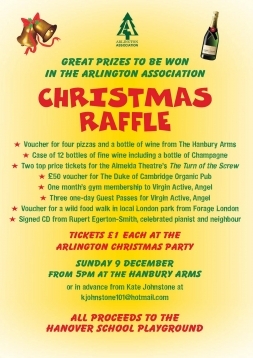 Hanover School Playground appeal has been selected as the local good cause to benefit from the Arlington Association Christmas raffle to be held at our annual Christmas Party on Sunday 9th December from 5pm in the Hanbury Arms Pub on Arlington Square. As is now traditional there will be community singing accompanied by our resident pianist Rupert Egerton Smith and the ever popular Arlington Singers. There will be mulled wine and mince pies so please come along and enjoy this festive event with your neighbours, everyone welcome. This has been a week for gardening awards for the Arlington Association and our neighbourhood. 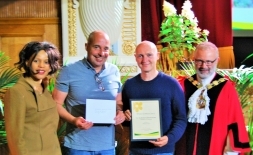 At the Islington in Bloom awards on Wednesday the Rees Street Community Garden was placed third in the Forgotten Corner Category and won a Bronze Medal. The Rees Street Tree Pits were awarded second place in Best Tree Pits category and awarded a Gold Medal. 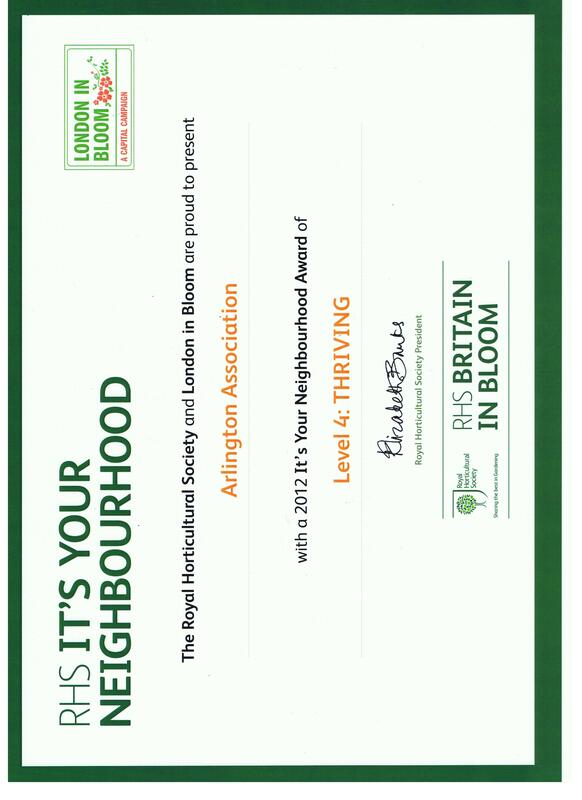 On Thursday it was the Royal Horticulture Society It’s Your Neighbourhood awards where the Arlington Association was awarded a Level 4 status – Thriving, which is the second highest level possible and one better than our Level 3 award in 2011. Scores are awarded in 3 criteria – Community Participation where we got 32 out of 40, Environmental Responsibility where we got 22 out of 30 and in Gardening Achievement where we got 23 out of 30 giving us a total of 77 out of 100 compared to 64 out of 100 in 2011. We have made particular improvement in our Community Participation score which was 22 out of 40 last year. It is good to see our work being recognised in Nationwide and Borough wide programmes and sincere thanks to all those who have helped over the last 12 months in so many ways to help build a stronger community and make the square a place for all to enjoy. Thanks to everyone who turned out today for the Arlington Square Big Autumn Bulb Plant. 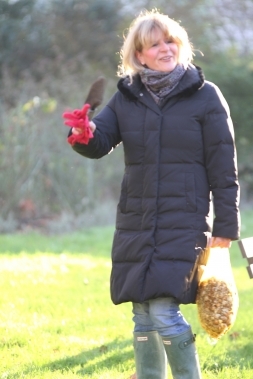 Amazingly we planted 5480 bulbs including 2000 Daffodils, 1470 Crocus, 1000 Bluebells and 1800 Snowdrops. The square should look wonderful next Spring. This brings us to a grand total of over 20,000 trees, shrubs, plants and bulbs planted over the last 18 months in Arlington Square. Our work gets a mention in the letter page of The Islington Tribune this week (page 11). There is a new video on this website in the gallery pages of the September gardening come cook-up session. As always thanks to Julie for putting this video together. We will have a final monthly gardening session on Saturday, 10th November when we will have a few more bulbs (only 2000) to plant and some interesting shrubs. It is that time a year again when we start to prepare the square for next Spring. We plan to build on the magnificent display of colour we had this Spring and plant more bulbs in the areas that have none. So for our October Community Gardening Day this coming Saturday (6th) we will have a selection of Spring bulbs to plant and we have a lot so please try to come along and help even for a short time, all the family welcome. We will be there from 10.00am and as always people of all gardening abilities welcome and please bring gardening gloves and a trowel if you have them, if not we can supply. We will provide tea and coffee so please bring a mug along. Current BBC Weather forecast is for sun so fingers crossed. Thanks to everyone who helped at the Community Gardening Day yesterday. We were blessed with good weather and a delicious lunch cooked by Kate from produce from the Community Garden. There is plenty of curly kale left in the community garden so please help yourselves. We have started to prepare the beds in the Community Garden for Autumn and Winter planting. Whilst we have yet to calculate the financial success of the Summer Fete we can say it was a truly successful community event. It was great to see the square come alive with the sound of neighbours of all ages having fun and getting to know each other. One of the highlights for me was meeting a lady who had grown-up and lived on the square from the 40’s to the 70’s and hearing about previous events in the square one of which involved a performance by the Dagenham Girl Pipers. Clearly the Whittington Steel Band and Joe the wandering accordionist were continuing a tradition of spectacular musical entertainment. Many thanks to everyone who helped make yesterday such a wonderful day, these events involve a lot of work. It is thanks to their considerable generosity in giving up their time and making donations we can have such events. I know we all appreciate it and our community is the stronger for it. 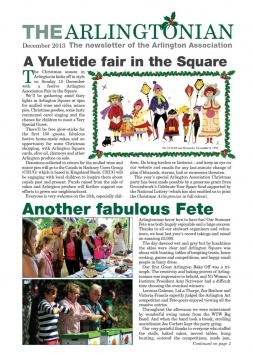 It has been a busy summer with three memorable events in the square, we have the Christmas Party on Sunday 9th December in the Hanbury to look forward to and put the 2013 fete in your diaries for Saturday 7th September 2013. We have some fantastic stalls and remember all money raised goes to improve the square or local good causes, so please be generous in your support of this community event. Islington Council is holding two consultation events to get your opinion on proposed design ideas for the park redevelopment. Come along and tell the designers what you think! 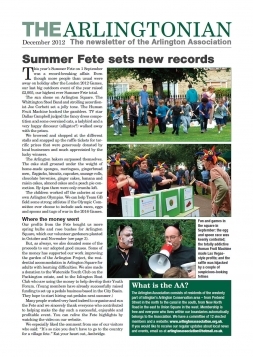 The summer edition of The Arlingtonian has been published. 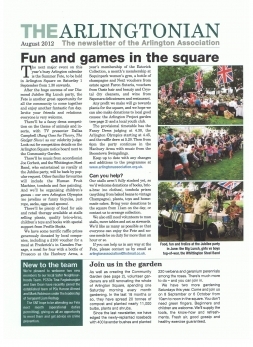 Full of information from the success of our Diamond Jubilee Big Lunch to a brief history of our neighburhood. Thanks to Alison and Jeffery for making it such a great newsletter. 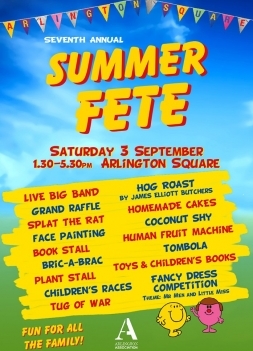 Many thanks to those people who have volunteered to help organise the forthcoming Arlington Square Summer Fete on Saturday 1 September from 1.30pm. We now have an owner for each of the stalls but we are still very short of volunteers to help run the stalls and activities so please do email us if you can spare an hour on the day itself, this event will only be a success if lots of people get involved. On the day we need people to volunteer to man stalls, move tables, act as stewards. We need lots of volunteers so everyone can enjoy the fete and people are not stuck manning stalls for the whole day. We would hope people would be asked to only do an hour and where there are two parents volunteering we will ensure you are not scheduled at the same time. We will give more details nearer the time on how to get donations to us and even if you are not going to be around on the day we can arrange to collect donations before 1st September. 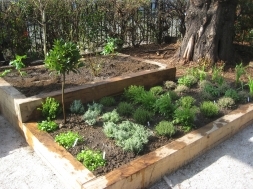 Our community garden is bursting with tasty offerings at the moment so don't forget our herb bed when you are cooking a roast, making a pasta sauce etc. We have an abundance of rosemary, marjoram, sage and two thyme options. Together with mint in the large terracotta pots - perfect for fresh mint tea, minted new potatoes or added to a lamb roast. They will stay thick and bushy and keep coming up if we regularly pick them. The lettuces are almost over so do help yourself to the outer leaves whilst you can. The beans have had a slow start with all this rain and not much sunshine but once the beans start to plump in the pods do pick as these, like the lettuces will bear further produce if we keep picking. The rhubarb still needs to bed in but next year will be wonderful. It loves the spot there under the tree so I think we will have plenty to make into crumbles, compotes etc in 2013. The carrots and onions are not yet ready. The carrot tops will become obvious near harvest time and the diameter of the top will give an indication of the overall carrot size. The onion greenery will die down, a further ten days later they will be ready to harvest (on a dry day, so they don't turn mouldy) and then further drying above ground for a few days before eating. We will be planting some spinach soon for the winter and some further herbs so keep a look out! 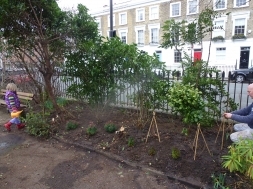 Good progress has been made by Arlington Association volunteers on the garden makeover for the Arlington Project at 13/14 Arlington Square. New paths and beds have been created and the existing beds have had edging installed and the planting improved. Through the summer the new and existing beds will have flowers, climbers and herbs planted. 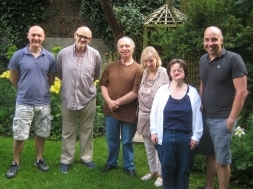 The Arlington Project is run by Islington Council and provides care and accommodation for six adults with learning disabilities. 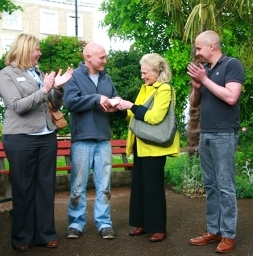 The garden makeover is funded by the Arlington Project and from a donation from the Arlington Association. Residents and staff are now familiar faces at AA events. Despite rain interrupting play at the start of our gardening session on Saturday we achieved a lot. Many thanks to all those volunteers who turned out to help plant and weed. The rain has certainly been good for the weeds, but I must say the circular beds are looking stunning and will continue to brighten the square in the weeks to come as more lilies and plants come into flower. Special thanks to Kate who lead on the makeover of the two beds in the central raised area, these were looking very sad and now having been weeded and planted-up they are looking good. We will continue to enhance these through the year. Next gardening day is Saturday 4th August. This weekend we welcomed 169 Open Garden Squares Weekend visitors and all were full of appreciation and praise for the square and for our new Community Garden. Visitors came from as far as Hertfordshire, Cambridge and Croydon and included the UK’s foremost Visitor Attraction and European garden expert, directors and staff of our national tourist board VisitBritain, and representatives from the Metropolitan Public Gardens Association who helped fund our work, the National Gardens Scheme and the London Parks and Gardens Trust. 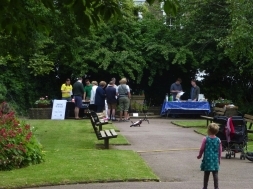 On Sunday Islington Friends of the Earth added to the fun promoting this summer’s Bee Cause raising awareness of the importance of bees, their recent dramatic decline and the need for bee-friendly flowers. 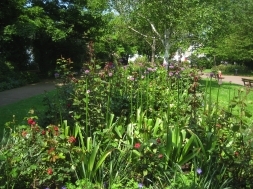 Our grateful thanks to the volunteer gardeners who helped restore the rose beds to their pre-Jubilee party splendour and added yet more plants to the circular and perimeter beds. And many thanks to Geraldine, Rod, Dee, Eleanor and Carolyn who helped welcome the visitors, hand out our explanatory leaflets and answer their gardening questions. Gordon and Paul proved to be excellent garden tour guides. 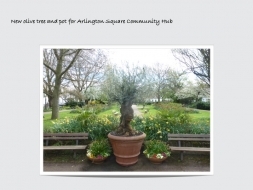 A video by our own award winning director Julie Edwards on the making and planting of the Arlington Square Community Garden has now been loaded in the Gallery section of this website. Wendy and Dee want to pass on their sincere thanks to all those who made such a tremendous effort to bake cakes for our Diamond Jubilee Big Lunch Cake Stall. Not only did all the cakes rise to perfection but so did the community to their call for cakes. Never before in the history of Arlington Square has a table been so filled with such a wonderful and colourful selection of cakes. 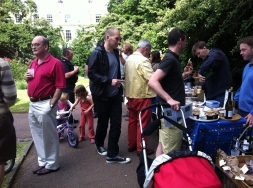 Our Diamond Jubilee Big Lunch in Arlington Square was a huge success enjoyed by several hundred people. Highlights of the day included a children's fancy dress competition, a royalist vs republican tug of war, a visit by the Fire Brigade, the Human Fruit Machine and a wonderful selection of homemade cakes. Long to rain over us! Whilst the weather is looking uncertain for the holiday weekend, preparations continue for the Arlington Square Diamond Jubilee Big Lunch on Monday afternoon. 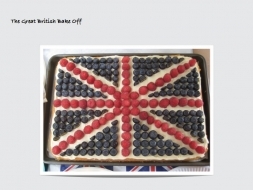 The national grid has reported a surge in usage as ovens are switched on for homemade cake baking. Streets are becoming festooned in red, white and blue. No matter what the weather our community big lunch will proceed as planned from 1pm when the Whittington Steel Band will strike-up a melody of rousing tunes. Enclosed is the poster reminding you of some of fantastic things we have planned. Festivities start at 1pm come rain or shine. 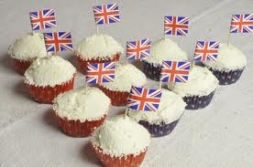 One of the highlights of any Arlington Association event is the Homemade Cake Stall and the Diamond Jubilee Big Lunch on 4 June will be no exception. 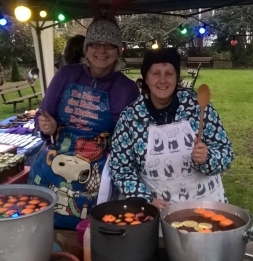 Dee and Wendy have stepped up to the challenge of running the stall and they would be delighted if the community could step up to the challenge of flooding them with donated cakes. Please let Dee and Wendy know if you can help with a cake donation no matter how small at arlingtonassociation@hotmail.co.uk or bring them along on the day to the square from noon. All proceeds from sales go to help improve the square and local good causes. Plans for the Diamond Jubilee Big Lunchon Monday 4th June at 1pm as well advanced. We will have live music, children's treasure hunt, food stalls, fancy dress, Human Fruit Machine, tug of war and much more. 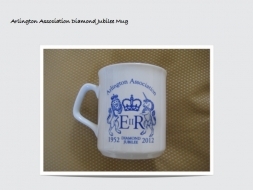 We will also be selling a special edition Arlington Association Diamond Jubilee Mug. It is a little under 3 weeks until we welcome visitors to Arlington Square for London Open Squares Weekend. We are participatiing for the first time and will be showing visitors how we are transforming the square. This photo shows one of the recently restored rose beds that were planted with 80 new roses, 3000 daffodils, 600 Alliums and 400 Lavender thanks to a grant from The Big Lottery. Open Squares Weekend is Saturday 9th and Sunday 10th June and we need volunteers to sell plants and tickets. Please email if you can spare an hour. Saturday 9th is also our regular community gardening day and we will be doing some planting and weeding. Everyone is welcome no matter what level of gardening expertise, it is a great way to meet neighbours and get involved in the community. Last night’s performance by our very own Rupert Egerton-Smith at the Islington Proms was a triumph. The well attended recital in St James’s Church had been sponsored by the Arlington Association and there was a great representation of AA members in the audience. The repertoire ranged from Bach to Debussy and Rupert gave a world-class performance. The Arlington Project is located on Arlington Square and provides residential accommodation for six adults with learning disabilities. The Arlington Project benefited from a donation last year of £150 from the proceeds of our Summer Fete and has been selected as one of our good causes for 2012. The money is being used to give their back garden a bit of a makeover and four Arlington Association volunteers are leading on this. 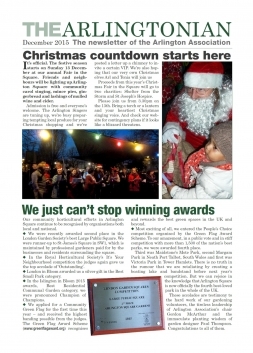 Attached is the first Newsletter from the Arlington Project, it gives a little update on the six service users. Margaret the manager, the service users and the staff are all very appreciative of the work the Arlington Association is doing and feel much more engaged with the local community in which they live and work. A meeting was held on 15th May by the Council Greenspace Department and chaired by Councillor Klute for local organisations to get an update on the redevelopment of Union Square and give input to how the consultation process should proceed. Background is that part of the redevelopment of the Packington Estate £174,000 has been allocated to improving Union Square Gardens. This is called Section 106 money where the Council requires the developer to provide funds for local improvements as a condition of planning permission. Outcome of the meeting was that a Landscape Designer will be engaged to come up with a variety of concepts on how Union Square could be improved to encourage greater use by the community. These concepts will be displayed at the celebration party planned by Hyde Housing in Union Square on Friday 14 September and the whole community will be invited to give input and feedback on the concepts. There is likely to be other consultation opportunities. Based on this and other community input the proposal will be further refined. Two new pots were installed in the Community Garden during our Community Gardening Day on Saturday 5th May. The large terracotta pots both have an olive tree in the center and are under planted with different varieties of mint. A new video has been loaded on this website in the Gallery section. The April Gardening Video shows what we did on the last Community Gardening Day in April. Don’t forget the next Community Gardening Day is this coming Saturday when we have lots more plants to go into the beds in the square. 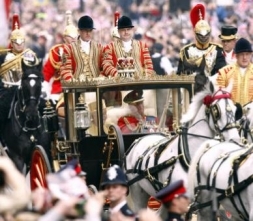 We have also loaded the short video clip from German TV on our Royal Wedding Party last year. A big thank you to Geoff, Justin and Julie who made the video possible and of course the stars of the video our gardening volunteers and Bertie the cat. 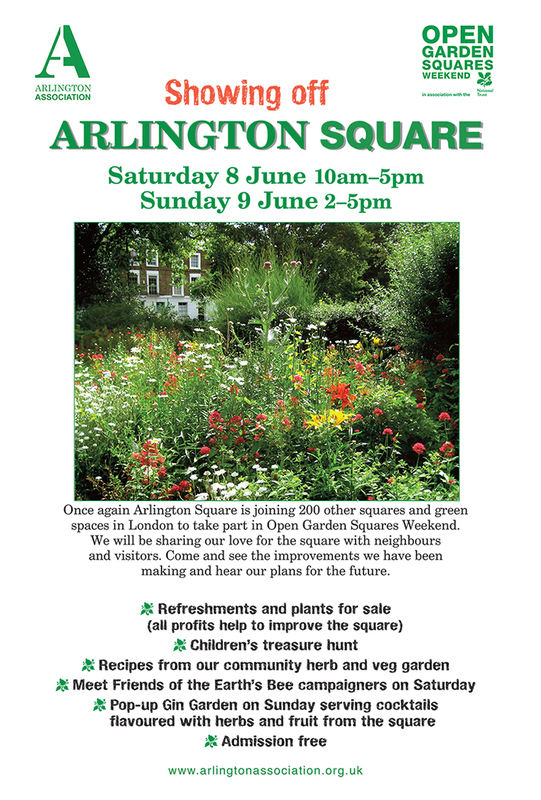 For the first time Arlington Square will participating in Open Squares weekend on 9th and 10th June. 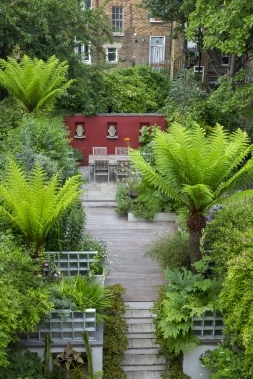 This year 212 gardens in 27 of London’s boroughs will be taking part in the annual and extremely popular Open Garden Squares Weekend. Arlington Square is one of 23 new gardens which will be opening their gates for the first time as part of the weekend. The weekend gives members of the public to explore London\'s public and private squares and open spaces. 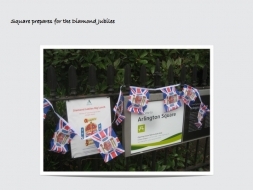 To mark the Queen’s Diamond Jubilee the Arlington Association will be planting a tree in Arlington Square. 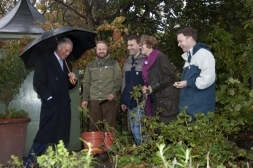 The Woodland Trust is encouraging the nation to plant 6 million trees during 2012. We will plant a Cornus Kousa Chinensis which is a particularly lovely tree. Planting will take place at the next Community Gardening Day on Saturday, 5th May. Today marks the 10th anniversary of our founding. Valerie Hansard and Hazel Fletcher energised the community to come together to deal with problems of anti-social behaviour in Arlington Square and the neighbourhood in general. Ten years on we are fortunate to be able to focus on making good things happen and building a stronger community. At the heart of what we do is seeing the challenges and opportunities we have as a community and taking action to address them. 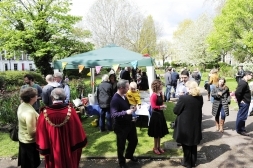 The official opening of the Arlington Square Community Garden by the Mayor of Islington was a great success. We were fortunate with the weather and around 200 local people turned out to see the official opening, enjoy the Martin Klute Jazz Trio and enjoy some food and wine. Valerie Hansard the founding Chair or the Arlington Association planted a tree to celebrate the 10th anniversary of the founding of the association. 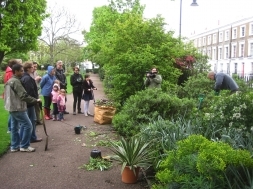 Many thanks to all the volunteers who turned out for yesterday’s Big Plant in Arlington Square. We had under 6’s and over 60’s working together. People who had moved into the area a matter of weeks ago got to meet people who had lived in the area for many decades. Unbelievably we managed to plant just over 3,000 bulbs, plants and shrubs, bringing to more than 10,000 that have been planted in the last 12 months. The square looks better month by month as all the hard work pays off. Next Saturday we can come together as a community to celebrate not just the official opening of the Arlington Square Community Garden but also the 10th anniversary of the founding of the Arlington Association. We hope it will be a great community event and everyone is welcome. More details will follow later in the week but the event starts at 1pm and there will be food, refreshments and live music as well as children’s activities. Next Community Gardening Day is Saturday 5th of May. The next community gardening day in Arlington Square is this Saturday the 14th April from 10.00am. This month’s session will be one of the biggest of the year and will see us planting 400 lavenders to create a border for the 4 rose beds, we will also be planting more plants, bulbs and shrubs in the perimeter and circular beds. Getting the new Community Garden ready for the official opening ceremony on the following Saturday will be a high priority. We will be there well into the afternoon but feel free to pop along for a short period and at any point in the day, we really do need a lot of help. Weather forecast is for sun with some cloud. Please bring gardening gloves, a trowel and perhaps a garden hoe if you have them, if you don’t we can lend you some. Tea and coffee will be provided so please bring a mug. It will be a great community day and a chance to meet your neighbours so please come along. All the family welcome and people of all gardening abilities. We are proud to launch The Arlingtonian, The Newsletter of the Arlington Association. With so much going on in the area and our wish to keep the community informed and encourage everyone to get involved we are launching today The Arlingtonian. We plan to publish our newsletter quarterly and will distribute a black and white version to all the homes in the area the Arlington Association covers. Distribution will take place by AA volunteers after Easter. We hope you enjoy the newsletter and we very much welcome suggestions on how we can improve it and any ideas for articles for future editions. 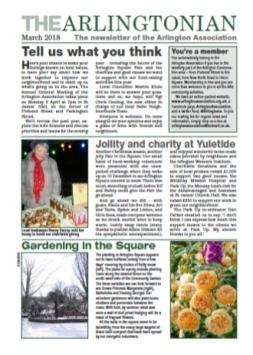 Our thanks go to Alison Rice and Jeffery Pike who have used their considerable journalistic and publishing skills to create such a professional looking newsletter. Many thanks to all the suggestions for good causes the Arlington Association could support during 2012/13. Based on that input and our desire for the causes to be local and where a small donation makes a real difference we proposed at the AGM we support the following good causes in 2012/13. Local Youth Club – we will talk to Councillor Klute and Police SNT on which one to support. The AGM voted unanimously to approve the proposal and as we raise funds at our events we will make a small donation of around £150 to each good cause. Over the coming weeks and months more content will be loaded and we are interested in hearing from you what developments you would like to see. There is a Bulletin Board where you can post local news and ask for help. The History page has some historical facts about the area and we are very keen to develop this section of the website so if you can contribute any insight to the history of the area, recent or ancient please get in touch. We will be adding more videos to the Gallery (check out the current ones) and we are keen to have lots of photos of the area so if you are a keen photographer please get in touch. Additionally, there is a News page giving the latest updates on AA activities and the Events page details the planned events for 2012. There are details about the Safer Neighbourhood’s Team and useful contact details are also listed on the Contact page. Over time the website will replace the emails we send out so please register via the Contact page for updates. On the Contact page you can use the feedback section to give input. Many thanks go to Mike Stephenson who has developed the site and Julie Edwards and Alison Rice who have made the video clips, they have all worked so hard to bring these developments to fruition. The new Community Garden in Arlington Square is quickly taking shape. Thanks to a team of Arlington Association volunteers of all ages and with some help from Capital Growth we have started to plant the six raised beds with herbs, seeds and plants. We also planted three new cherry trees and three bay bushes along the hedge and created a new “hedgerow” of fruiting shrubs in the wooded area next to the garden. The Community Garden will see further planting in the coming weeks and if you want to get involved please respond to this email. A new noticeboard has been installed on the hut and a new finial now crowns it. The Council will replace the current door in April, hence why it looks a little odd at the moment. Next big community gardening day in the square will be Saturday 14th April when we will be completing the rose bed restoration with 400 lavenders as well as continuing to plant the perimeter and circular beds. If you have not been in the square in recent weeks it is looking wonderful with all the daffodils and other spring bulbs in bloom and the cherry blossom is starting to bloom as well. Don’t forget about the AGM on Monday at 7pm in the Hanbury when we will showing two new videos about the recent planting in the square and announcing our new website address. Many thanks to all the volunteers who turned out today. 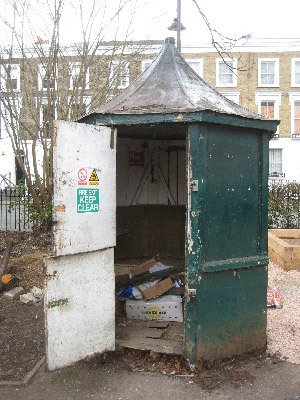 A new community noticeboard has been installed on the outside of the hut near the Community Garden in Arlington Square. This will be used to keep the wider community updated on developments and activities in the square. It also has a map identifying the trees in the square. The Arlington Association AGM will take place on Monday 26th March at 7 pm in the upstairs room of the Hanbury. 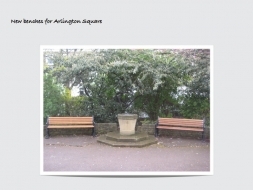 In addition to the usual updates there wil be the premier of the new Arlington Association films on Arlington Square. Nominations have now closed for the 2012/13 Arlington Association Committee. Four people put forward their names to serve on the committee and four of the existing committee decided not to stand for re-election. Our existing Chair, Rod Austin has decided not to stand again for Chair and our current Deputy Chair, Gordon McArthur is happy to take on the responsibilities of Chair. Rod is happy to become Deputy Chair and Hazel and Martin are happy to remain as Secretary and Treasurer. So this leaves us with the position that no election is necessary. Many thanks to Rachel Hanks, Sue Smith, Geraldine O’Connor and Carolyn Wagstaff for their contribution to the work of the association, they will be missed at committee meetings, all four have pledged to continue their strong support for the work of the association. We warmly welcome Alison Rice, James Hewson, Wendy Fisher Gordon and Amy Chapman to the committee, all of whom have already made a strong contribution to a variety of community activities. 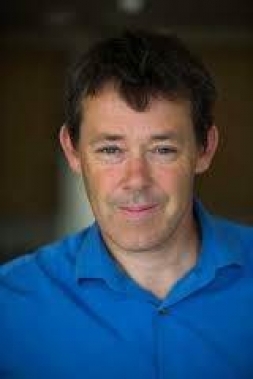 Our thanks also go to Rod for steering the association so ably over the last two years. A list of the new committee is attached and this will take effect from the close of the AGM on Monday 26th March. 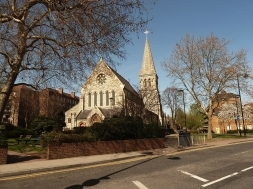 Please don’t forget to join us for the AGM and a glass of wine in the Hanbury next Monday, 26th March at 7pm when we will have an update from our ward Councillor, Martin Klute. Also an update from our Sergeant Liam Redrup of the SNT and Ian Shacklock, Chair of Friends of the Regent\' Canal will say a few words about current plans for the towpath on the canal. The build phase of the Arlington Square Community Garden is now complete and we will now move forward to plant the raised beds with a mix of herbs, vegetables and flowers. We will also be planting some shrubs and trees to ease the site lines of the garden. Our objective for the garden is for it to be a tranquil spot that can be enjoyed by the whole community. We want the garden to look lovely throughout the seasons. If you would like to get involved in deciding exactly what is planted season by season and participate in the planting and care of the garden please email us at arlingtonassociation@hotmail.com. We are organising training from experienced community gardeners on how we care for the garden so it thrives through the seasons. If you have any suggestions please email arlingtonassociation@hotmail.co.uk with details and how we can contact you and the good cause. The AA committee will draw-up a list of good causes we would look to support in 2012 and share it with members at our AGM in March. 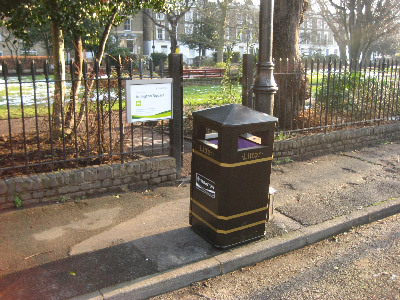 A new litter bin has been installed on the pavement outside the north-west gate of Arlington Square. 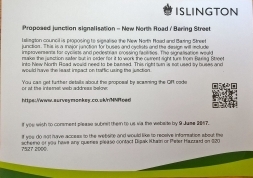 The Arlington Association supported by our ward councilor Martin Klute have been lobbying for this. Hopefully this will help reduce litter and assist responsible dog owners. 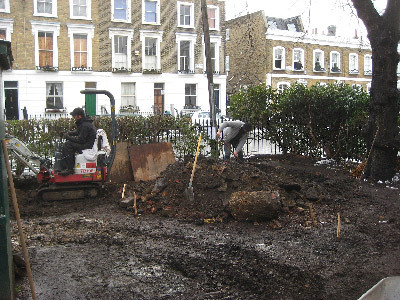 Work has started today on the construction of the Big Lottery funded Arlington Square Community Garden.